 如WO2012/177337所述，对于丙烯酸系粘合剂而言存在两种主要的交联机理：多官能烯键式不饱和基团与其它单体的自由基共聚作用，和通过诸如丙烯酸之类的官能单体的共价或离子交联。  As described WO2012 / 177337, the two major crosslinking mechanisms for acrylic adhesives terms: the radical copolymerization of multifunctional ethylenically unsaturated groups with other monomers, such as acrylic acid and by covalent or ionic functional monomers such crosslinking. 另一种方法是使用UV交联剂（诸如共聚型二苯甲酮）或后添加的光交联剂（诸如多官能二苯甲酮和三嗪）。 Photocrosslinker added after Another method is using a UV crosslinker (such as benzophenone copolymer), or (such as multifunctional benzophenones and triazines). 在过去，使用多种不同的材料作为交联剂，例如多官能的丙烯酸酯、苯乙酮、二苯甲酮和三嗪。 In the past, a variety of different materials as crosslinking agents, such as polyfunctional acrylates, acetophenones, benzophenones and triazines. 然而，上述交联剂具有某些缺点，这些缺点包括如下中的一者或多者：高挥发性；与某些聚合物体系不相容；产生不期望的颜色；需要单独的光敏化合物来引发交联反应；以及对氧的高度敏感性。 However, the crosslinking agent has certain disadvantages which comprises one or more of: high volatility; incompatibility with certain polymer systems; undesirable color; photosensitive compound required to elicit a separate crosslinking reaction; and high sensitivity to oxygen. 电子工业和其中PSA接触金属表面的其它应用的特定问题是腐蚀性副产物的产生以及不期望的颜色的产生。 Specific issues electronics industry and other applications where a PSA is to create contact with metal surfaces corrosive byproducts and undesired color. 图1示出了损耗角正切值，剪切损耗模量（G〃）对剪切储能模量（G'）的比率，如通过动态力学分析所测定。  FIG 1 shows tan delta values, the shear loss modulus (G〃) the ratio of the shear storage modulus (G '), as determined by dynamic mechanical analysis. 因此，工业上将发现用于（例如，压敏）粘合剂的替代交联剂的优点。  Accordingly, it will find use in industry (e.g., pressure-sensitive) adhesive of the advantages of cross-linking agent. 在一个实施例中，描述了一种压敏粘合剂组合物，该压敏粘合剂组合物包含至少50重量％的聚合单元，该聚合单元衍生自（甲基）丙烯酸烷基酯单体；和0. 2重量％至15 重量％的至少一种交联单体，该至少一种交联单体包含（甲基）丙烯酸酯基团和(：6_(： 2。烯烃基团，该烯烃基团为直链或支链的，并任选地被取代。  In one embodiment, there is described a pressure-sensitive adhesive composition, the pressure-sensitive adhesive composition comprises at least 50 wt% polymerized units, units derived from the polymerization of (meth) acrylic acid alkyl ester monomer; and 0.2 wt% to 15 wt% of at least one crosslinking monomer, the crosslinking monomer comprising at least one (meth) acrylate group, and (: 6_ (: 2. olefin-yl group, the olefinic group is a straight-chain or branched, and optionally substituted. 在另一个实施例中，描述了一种压敏粘合剂组合物，该压敏粘合剂组合物包含至少50重量％的聚合单元，该聚合单元衍生自（甲基）丙烯酸烷基酯单体；和0. 2重量％至15重量％的至少一种交联单体，该至少一种交联单体包含（甲基）丙烯酸酯基团和环状C6-C8稀经基团，该稀经基团任选地被取代。  In another embodiment, there is described a pressure-sensitive adhesive composition, the pressure-sensitive adhesive composition comprises at least 50 wt% polymerized units, units derived from the polymerization of (meth) acrylic acid alkyl ester monomer; and 0.2 wt% to 15 wt% of at least one crosslinking monomer, the crosslinking monomer comprising at least one (meth) acrylate groups and cyclic groups by C6-C8 dilute group, which group is optionally diluted by substituted. 在另一个实施例中，描述了一种粘合剂组合物，该粘合剂组合物包含浆料，该浆料包含i)自由基聚合型溶剂单体；和ii)溶质（甲基）丙稀酸类聚合物，该溶质（甲基）丙稀酸类聚合物包含聚合单元，该聚合单元衍生自一种或多种（甲基）丙烯酸烷基酯单体；其中浆料包含至少一种交联单体，或（甲基）丙稀酸类溶质聚合物包含聚合单元，该聚合单元衍生自至少一种交联单体，该交联单体包含（甲基）丙烯酸酯基团和C6-C2。  The radical polymerizable monomer solvent In another embodiment, there is described an adhesive composition, the adhesive composition comprises a slurry, the slurry comprising I); and ii) a solute (A yl) acrylic-based polymer, the solute (meth) acrylic acid based polymer comprises polymerized units polymerized units derived from one or more (meth) acrylate monomer; wherein the slurry comprises at least one crosslinking monomer, or (meth) acrylic acid-based polymer comprises polymerized units of a solute, the polymerized units derived from at least one crosslinking monomer, the crosslinking monomer comprises (meth) acrylate groups group and a C6-C2. 烯烃基团，该烯烃基团为直链的、支链的或环状的，并任选地被取代。 Alkene group, an olefin group that is linear, branched or cyclic, and is optionally substituted. 在另一个实施例中，描述了一种制备粘合剂组合物的方法，该方法包括：a)提供浆料，该浆料包含：i)自由基聚合型溶剂单体；和ii)溶质（甲基）丙稀酸类聚合物，该溶质(甲基）丙稀酸类聚合物包含聚合单元，该聚合单元衍生自一种或多种（甲基）丙烯酸烷基酯单体；其中浆料包含至少一种交联单体，或（甲基）丙稀酸类溶质聚合物包含聚合单元， 该聚合单元衍生自至少一种交联单体，该交联单体包含（甲基）丙烯酸酯基团和(： 6_(：2。烯烃基团，该烯烃基团任选地被取代；以及b)向基材施加浆料；以及C)照射所施加的浆料， 从而使粘合剂组合物交联。  In another embodiment, a method is described of preparing an adhesive composition, the method comprising: a) providing a slurry, the slurry comprising: i) free-radically polymerizable solvent monomer; and ii ) solute (meth) acrylic acid-based polymer, the solute (meth) acrylic acid based polymer comprises polymerized units polymerized units derived from one or more (meth) acrylate monomer; wherein the slurry comprises at least one crosslinking monomer, or (meth) acrylic acid-based polymer comprises polymerized units of a solute, the polymerized units derived from at least one crosslinking monomer, the crosslinking monomer comprises (meth ) acrylate groups, and (: 6 _ (: 2 olefinic groups, of the olefin group is optionally substituted; and b.) applying a slurry to a substrate; and irradiating the applied slurry C), so that the adhesive crosslinked adhesive composition. 在另一个实施例中，描述了一种制备粘合剂组合物的方法，该方法包括：a)在有机溶剂中聚合i) 一种或多种（甲基）丙烯酸烷基酯单体，和ii)交联单体，该交联单体包含（甲基）丙烯酸酯基团和C6-C2。  In another embodiment, a method is described of preparing an adhesive composition, the method comprising: a) polymerizing i) one or more (meth) acrylic acid alkyl ester monomer in an organic solvent body, and ii) a crosslinking monomer, the crosslinking monomer comprises (meth) acrylate group and a C6-C2. 烯烃基团，该烯烃基团任选地被取代；以及b)向基材施加聚合单体的溶液；以及c)固化该溶液，从而使粘合剂组合物交联。 Alkene group, an olefinic group which is optionally substituted; and b) a polymerizable monomer solution is applied to the substrate; and c) curing the solution, so that the adhesive composition is crosslinked. 本公开描述了由可交联（例如，浆料）组合物制备的压敏粘合剂（PSA)以及制品。  The present disclosure describes a cross-linked (e.g., slurry) pressure sensitive adhesive (PSA) compositions and articles prepared. 交联压敏粘合剂提供了粘性、剥离粘附力和剪切保持力的合适平衡。 It provides a crosslinked pressure sensitive adhesive tack, peel adhesion, and shear holding power suitable balance. 另外，在IHz的频率下，压敏粘合剂在涂敷温度（通常室温（25°C))下的储能模量小于3X105达因/厘米。 Further, at a frequency of IHz, the pressure sensitive adhesive coating temperature (usually room temperature (25 ° C)) storage modulus at less than 3X105 dynes / cm. 在一些实施例中，粘合剂在大于室温的涂覆温度下为压敏粘合剂。 In some embodiments, the adhesive at the application temperature is greater than room pressure sensitive adhesive. 例如，涂覆温度可为30°C、 35°(：、40°(：、45°(：、50°(：、55°(：或65°(：。在该实施例中，在1抱的频率下，压敏粘合剂在室温(25°C)下的储能模量通常小于3XIO6达因/厘米。在一些实施例中，在IHz的频率下，压敏粘合剂在室温（25°C)下的储能模量小于2XIO6达因/厘米或IX10 6达因/厘米。 For example, the coating temperature may be 30 ° C, 35 ° (:, 40 ° (:, 45 ° (:, 50 ° (:, 55 ° (: or 65 ° (:. In this embodiment, the hold 1 at a frequency, the pressure-sensitive adhesive storage modulus at room temperature (25 ° C) is generally less than the 3XIO6 dynes / cm. in some embodiments, at a frequency of IHz, the pressure-sensitive adhesive at room temperature ( a storage modulus at 25 ° C) is less than 2XIO6 dynes / cm or IX10 6 dynes / cm. "浆料组合物"是指溶质聚合物在一种或多种溶剂单体中的溶液，该组合物在25°c 下具有IOOcP至8,OOOcP的粘度。  "slurry composition" refers to a solution in a solute polymer of one or more solvent monomers, the composition has IOOcP to 8, OOOcP viscosity at 25 ° c. 浆料的粘度大于溶剂单体的粘度。 The viscosity of the slurry is greater than the viscosity of the solvent monomers. 在本文中，"（甲基）丙烯酰基"包括（甲基）丙烯酸酯和（甲基）丙烯酰胺。  As used herein, "(meth) acryl" includes a (meth) acrylate and (meth) acrylamide. 在本文中，"（甲基）丙烯酸类"包括甲基丙烯酸类和丙烯酸类两者。  As used herein, "(meth) acrylic" includes both acrylic and methacrylic. 在本文中，"（甲基）丙烯酸酯"包括甲基丙烯酸酯和丙烯酸酯两者。  As used herein, "(meth) acrylate" includes both methacrylate and acrylate. 术语"烷基"包括直链、支链和环状烷基基团并且包括未取代的和取代的烷基基团两者。  The term "alkyl" includes straight chain, branched and cyclic alkyl groups and includes both unsubstituted and substituted alkyl groups. 除非另外指明，否则烷基基团通常包含1至20个碳原子。 Unless otherwise specified, alkyl groups typically contain from 1 to 20 carbon atoms. 如本文所用，"烷基"的示例包括但不限于甲基、乙基、正丙基、正丁基、正戊基、异丁基、叔丁基、异丙基、正辛基、2-辛基、正庚基、乙基己基、环戊基、环己基、环庚基、金刚烷基和降冰片基等。 As used herein, an example of "alkyl" include, but are not limited to, methyl, ethyl, n-propyl, n-butyl, n-pentyl, isobutyl, tert-butyl, isopropyl group, n-octyl, 2 octyl, n-heptyl, ethylhexyl, cyclopentyl, cyclohexyl, cycloheptyl, adamantyl and norbornyl and the like. 除非另外指明，否则烷基基团可为一价或多价的。 Unless otherwise specified, alkyl groups may be monovalent or multivalent. 术语杂烷基是指烷基基团，如刚刚所定义，该烷基基团具有由链中杂原子（诸如0、S或N)取代的至少一个链中碳原子（S卩，处于链中）。  The term heteroalkyl refers to an alkyl group as just defined, the alkyl group having a hetero atom in the chain (such as 0, S or N) in at least one substituted carbon chain atom (S Jie, in-chain). 术语烯烃基团是指不饱和脂族直链、支链或环状（即，未取代）烃基团，该烃基团具有一个或多个双键。  The term olefinic group refers to an unsaturated aliphatic linear, branched or cyclic (i.e., unsubstituted) hydrocarbon group, the hydrocarbon group having one or more double bonds. 包含一个双键的那些常常称为烯基基团。 Those containing one double bond alkenyl group is often referred to. 在一些实施例中，环状烯烃基团包含小于10或8个碳原子，诸如就环己烯基而言。 In some embodiments, the cyclic olefin group contains less than 10 or 8 carbon atoms, such as cyclohexenyl terms of. 在一些实施例中，烯烃基团还可包含取代基，如随后将进行描述。 In some embodiments, the olefinic groups may comprise substituents, such as will be described later. 烯烃基团通常为一价的。 Alkene group is generally a monovalent. "可再生资源"是指在100年的时间框架内可被补充的自然资源。  "renewable resources" refers to the time frame 100 may be of natural resources supplement. 资源可自然地或经由农业技术补充。 Natural resources may be supplemented or via agricultural techniques. 可再生资源通常为植物（即，各种光合作用生物体中的任一者，包括所有陆地生物，包括树）、原生生物的生物体，诸如海藻和藻类、动物和鱼。 Plants typically renewable resources (i.e., any of various photosynthetic organisms, including all terrestrial organisms, including trees), protists organisms, such as seaweed and algae, animals and fish. 它们可为天然存在的、杂交体，或遗传工程生物体。 They may be naturally occurring, hybrids or genetically engineered organisms. 天然资源（诸如原油、煤和泥炭，它们耗费100年以上才形成）不视为可再生资源。 Natural resources (such as crude oil, coal and peat, they spend more than 100 years to be formed) is not considered a renewable resource. 当一个基团不止一次出现在本文中所述的式中时，每个基团都是"独立地"选取的，除非另外指明。  When more than once a group of the formulas herein, each group is "independently" selected, unless otherwise indicated. 粘合剂包含（甲基）丙烯酸类聚合物，该（甲基）丙稀酸类聚合物由与丙烯酸系粘合剂通用的一种或多种单体制备，诸如（甲基）丙稀酸酯类单体（也称为（甲基）丙烯酸酯单体和（甲基）丙烯酸烷基酯单体）任选地组合一种或多种其它单体，诸如酸官能烯键式不饱和单体、非酸官能极性单体和乙烯基单体。  binder comprising a (meth) acrylic polymer, the (meth) acrylic acid polymer of one or more monomers prepared with the acrylic pressure-sensitive adhesive commonly made, such as (meth) acrylic acid ester monomer (also referred to as (meth) acrylate monomers and (meth) acrylic acid alkyl ester monomers), optionally in combination with one or more other monomers such as acid functional ethylenically unsaturated monomers, polar monomers and non-acid functional vinyl monomers. (甲基）丙稀酸类聚合物包含衍生自（例如，非叔）醇的一种或多种（甲基）丙烯酸酯单体，该醇包含1至14个碳原子并且优选地为4至12个碳原子的均值。  (meth) acrylic acid based polymer comprises units derived from (e.g., non-tertiary) alcohols, one or more (meth) acrylate monomer, the alcohol contains from 1 to 14 carbon atoms, and preferably mean of 4 to 12 carbon atoms. 单体的示例包括丙烯酸或甲基丙烯酸与非叔醇的酯，该非叔醇为诸如乙醇、1-丙醇、2-丙醇、1-丁醇、2-丁醇、1-戊醇、2-戊醇、3-戊醇、2-甲基-1-丁醇、3-甲基-1-丁醇、 1-己醇、2-己醇、2-甲基-1-戊醇、3-甲基-1-戊醇、2-乙基-1-丁醇、3, 5, 5-三甲基-1-己醇、3-庚醇、1-辛醇、2-辛醇、异辛醇、2-乙基-1-己醇、1-癸醇、2-丙基庚醇、1-十二烷醇、 1-十三烷醇、1-十四烷醇，等等。  monomer examples include acrylic acid or methacrylic acid with non-tertiary alcohol, which is a non-tertiary alcohol such as ethanol, 1-propanol, 2-propanol, 1-butanol, 2-butanol, 1- pentanol, 2-pentanol, 3-pentanol, 2-methyl-1-butanol, 3-methyl-1-butanol, 1-hexanol, 2-hexanol, 2-methyl- pentanol, 3-methyl-1-pentanol, 2-ethyl-1-butanol, 3, 5, 5-trimethyl-1-hexanol, 3-heptanol, 1-octanol, 2 octanol, isooctanol, 2-ethyl-1-hexanol, 1-decanol, 2-propyl heptanol, 1-dodecanol, 1-tridecanol, 1-tetradecanol, and many more. 在一些实施例中，优选的（甲基）丙烯酸酯单体为具有异辛基醇的（甲基）丙烯酸的酯。 In some embodiments, the preferred (meth) acrylate monomer is a (meth) acrylate isooctyl alcohol with acrylic acid. 在一些有利的实施例中，单体为具有衍生自可再生源的醇的（甲基）丙烯酸的酯。  In some advantageous embodiments, the monomers are derived from renewable sources with an alcohol (meth) acrylic acid. 一种用于确定材料是否衍生自可再生资源的合适技术是根据ASTMD6866-10通过14C分析， 如US2012/0288692所描述。 A method for determining whether a material is derived from renewable resources suitable technique is 14C in accordance with ASTMD6866-10 by analysis, such as US2012 / 0288692 described. 应用ASTMD6866-10来得出"生物基含量"是建立与如放射性碳年代测定法相同的概念上，而无需使用年代公式。 Application ASTMD6866-10 to derive "biobased content" such as the establishment and radiocarbon dating same concept, without the use of a formula's. 通过得出未知样品中的有机放射性碳( 14C)的量对现代参考标准物的量的比率而执行分析。 And perform an analysis of the ratio of the amount of modern reference standard obtained by the amount of radioactive organic carbon (. 14C) in the unknown sample. 比率以单位"pMC"记录为百分比（现代碳百分比）。 Ratio in unit "pMC" is recorded as a percentage (percent modern carbon). 衍生自可再生源的一种合适单体为（甲基）丙烯酸2-辛基酯，如可通过常规技术从2-辛醇和（甲基）丙烯酰衍生物诸如酯、酸和卤酰进行制备。  derived from renewable sources of suitable monomers are (meth) acrylate, 2-octyl, can be by conventional techniques such as from 2-octanol and (meth) acrylic acid derivatives such as esters, acid halides, and acyl prepared. 2-辛醇可通过用氢氧化钠处理衍生自蓖麻油的蓖麻酸（或其酯或卤酰），之后将其从副产品癸二酸中蒸馏出而制备。 2-octanol can be prepared by a process derived from castor oil, ricinoleic acid (or ester or acyl halides) with sodium hydroxide, after which distilled from sebacic acid by-products. 可再生的其它（甲基）丙烯酸酯单体为衍生自乙醇和2-甲基丁醇的那些。 Other renewable (meth) acrylate monomers derived from ethanol and 2-methylbutanol those. 在一些实施例中，（例如，压敏）粘合剂组合物（例如，（甲基）丙稀酸类聚合物和/或自由基聚合型溶剂单体）包含至少25重量％、30重量％、35重量％、40重量％、45重量％、或50重量％的生物基含量，利用ASTMD6866-10,方法B。 In some embodiments, (e.g., pressure-sensitive) adhesive composition (e.g., (meth) acrylic acid polymer and / or free-radically polymerizable solvent monomer) comprising at least 25 wt%, 30 wt% , 35 wt%, 40 wt%, 45 wt%, or 50 wt% biobased content by ASTMD6866-10, method B. 在其它实施例中，（例如，压敏）粘合剂组合物包含至少55重量％、60重量％、65重量％、70重量％、75重量％、或80重量％的生物基含量。 In other embodiments, (e.g., pressure-sensitive) adhesive composition comprises at least 55 wt%, 60 wt%, 65 wt%, 70 wt%, 75 wt%, or 80 wt% biobased content. 在其它实施例中，（例如，压敏）粘合剂组合物包含至少85重量％、90重量％、95重量％、 96重量％、97重量％、98重量％或99重量％的生物基含量。 In other embodiments, (e.g., pressure-sensitive) adhesive composition comprises at least 85 wt%, 90 wt%, 95 wt%, 96 wt%, 97 wt%, 98 wt%, or 99 wt% biobased content . (例如，压敏）粘合剂（例如，（甲基）丙稀酸类聚合物和/或溶剂单体）包含一种或多种低Tg(甲基）丙烯酸酯单体，当反应以形成均聚物时，该低Tg(甲基）丙烯酸酯单体具有不大于l〇°C的Tg。  (e.g., pressure-sensitive) adhesive (e.g., (meth) acrylic acid polymer and / or solvent monomer) comprises one or more low Tg (meth) acrylate monomer, when when the reaction to form a homopolymer of the low Tg (meth) acrylate monomer having not more than l〇 ° C. Tg. 在一些实施例中，当反应以形成均聚物时，低Tg单体具有不大于0°C、不大于-5°C、或不大于-KTC的Tg。 In some embodiments, when the reaction to form a homopolymer, a low Tg monomer having not more than 0 ° C, not more than -5 ° C, or no greater than the Tg -KTC. 这些均聚物的Tg通常大于或等于-80°C、大于或等于-70°C、大于或等于_60°C、或大于或等于_50°C。 The Tg of the homopolymer is generally greater than or equal to -80 ° C, greater than or equal to -70 ° C, greater than or equal to _60 ° C, or greater than or equal to _50 ° C. 这些均聚物的Tg可例如在-80°C至20 °C、-70 °C 至10 °C、-60 °C 至0 °C、或-60 °C 至-10 °C 的范围内。 Tg of these homopolymers can be, for example, at -80 ° C to 20 ° C, -70 ° C to 10 ° C, -60 ° C to 0 ° C, or in the range of -60 ° C to -10 ° C to. 其中R1为H或甲基，并且R8为具有1至22个碳的烷基或具有2至20个碳和1至6个选自氧或硫的杂原子的杂烷基。  wherein R1 is H or methyl, and R8 is alkyl having 1 to 22 carbons, or heteroalkyl having from 2 to 20 carbons and 1 to 6 heteroatoms selected from oxygen or sulfur. 该烷基或杂烷基基团可为直链的、支链的、环状的、或它们的组合。 The alkyl or heteroalkyl group can be linear, branched, cyclic, or combinations thereof. 示例性低Tg单体包括例如丙烯酸乙酯、丙烯酸正丙酯、丙烯酸正丁酯、丙烯酸异丁酯、丙烯酸叔丁酯、丙烯酸正戊酯、丙烯酸异戊酯、丙烯酸正己酯、2-甲基丙烯酸丁酯、丙烯酸-2-乙基己酯、4-甲基-2-戊基丙烯酸酯、丙烯酸正辛酯、丙烯酸2-辛酯、丙烯酸异辛酯、丙烯酸异壬酯、丙烯酸癸酯、丙烯酸异癸酯、丙烯酸月桂酯、丙烯酸异十三烷基酯、丙烯酸十八烷基酯、以及丙烯酸十二烷基酯。  Exemplary low Tg monomers include, for example, ethyl acrylate, n-propyl, n-butyl acrylate, isobutyl acrylate, t-butyl acrylate, n-amyl acrylate, isoamyl acrylate, n-hexyl acrylate, 2 - methyl methacrylate, butyl acrylate, 2-ethylhexyl acrylate, 4-methyl-2-pentyl acrylate, n-octyl acrylate, 2-octyl acrylate, isooctyl acrylate, isononyl acrylate, decyl acrylate, isodecyl acrylate, lauryl acrylate, isotridecyl acrylate, octadecyl acrylate, and dodecyl acrylate. 低Tg杂烷基丙烯酸酯单体包括但不限于丙烯酸2-甲氧基乙酯和丙烯酸2-乙氧基乙酯。  Tg lower heteroalkyl acrylate monomers include, but are not limited to acrylate, 2-methoxyethyl acrylate and 2-ethoxyethyl acrylate. 在一些实施例中，（例如，压敏）粘合剂（例如，（甲基）丙稀酸类聚合物和/或自由基聚合型溶剂单体）包含一种或多种低Tg单体，该低Tg单体包括具有6至20个碳原子的烷基基团。  In some embodiments, (e.g., pressure-sensitive) adhesive (e.g., (meth) acrylic acid polymer and / or free-radically polymerizable solvent monomer) comprises one or more low Tg monomer, the low Tg monomer comprising an alkyl group having 6 to 20 carbon atoms. 在一些实施例中，低Tg单体包括具有7或8个碳原子的烷基基团。 In some embodiments, the low Tg monomer comprising an alkyl group having 7 or 8 carbon atoms. 示例性单体包括但不限于甲基丙烯酸-2-乙基己酯、甲基丙烯酸异辛酯、甲基丙烯酸正辛酯、甲基丙烯酸2-辛酯、甲基丙烯酸异癸酯和甲基丙烯酸月桂酯。 Exemplary monomers include, but are not limited to, methyl acrylate, 2-ethylhexyl methacrylate, isooctyl methacrylate, n-octyl methacrylate, 2-octyl methacrylate, isodecyl methacrylate and lauryl acrylate. 同样，一些甲基丙烯酸杂烷基酯也可使用，诸如甲基丙烯酸-2-乙氧基乙酯。 Similarly, some of the methyl heteroalkyl acrylate may also be used, such as methyl acrylate, 2-ethoxyethyl acrylate. 在一些实施例中，（例如，压敏）粘合剂（例如，（甲基）丙稀酸类聚合物和/或溶剂单体）包含具有大于KTC并且通常为至少15°C、20°C或25°C并且优选地至少50°C的Tg 的高Tg单体。  In some embodiments, (e.g., pressure-sensitive) adhesive (e.g., (meth) acrylic acid polymer and / or solvent monomers) comprising KTC and typically greater than at least 15 ° C, 20 ° C or 25 ° C and preferably at least at 50 ° C Tg of the high Tg monomers. 合适的高Tg单体的包括例如丙烯酸叔丁酯、甲基丙烯酸甲酯、甲基丙烯酸乙酯、甲基丙烯酸异丙酯、甲基丙烯酸正丁酯、甲基丙烯酸异丁酯、甲基丙烯酸仲丁酯、甲基丙烯酸叔丁酯、甲基丙烯酸硬脂酯、甲基丙烯酸苯酯、甲基丙烯酸环己酯、丙烯酸异冰片酯、甲基丙烯酸异冰片酯、甲基丙烯酸降冰片酯、甲基丙烯酸苄酯、丙烯酸3, 3, 5三甲基环己酯、 丙烯酸环己酯、N-辛基丙烯酰胺和甲基丙烯酸丙酯或其组合。 Suitable high Tg monomers include, for example, t-butyl acrylate, methyl methacrylate, methyl methacrylate, ethyl methacrylate, isopropyl methacrylate, n-butyl methacrylate, isobutyl methacrylate, sec-butyl, t-butyl methacrylate, ethylhexyl methacrylate, stearyl methacrylate, phenyl methacrylate, cyclohexyl methacrylate, isobornyl methacrylate, isobornyl methacrylate, norbornyl methacrylate, methacrylate, benzyl acrylate, 3, 3, 5 trimethylcyclohexyl acrylate, cyclohexyl acrylate, N- octyl acrylamide, and propyl methacrylate or combinations thereof. 在一些实施例中，（甲基）丙烯酸类聚合物为均聚物。  In some embodiments, the (meth) acrylic polymer is a homopolymer. 在其它实施例中，（甲基） 丙烯酸类聚合物为共聚物。 In other embodiments, (meth) acrylic polymer is a copolymer. 除非另外指明，否则术语聚合物是指均聚物和共聚物两者。 Unless otherwise indicated, the term polymer refers to both homopolymers and copolymers. 基于组分单体的Tg和其重量百分比，共聚物的Tg可通过使用Fox公式进行估计。  Based on the component monomers and the Tg percentage by weight, Tg of the copolymer can be estimated by using the Fox equation. 基于100重量份的总单体或聚合单元计，（甲基）丙烯酸烷基酯单体通常以至少85重量份、86重量份、87重量份、88重量份、89重量份或90重量份，至多达95重量份、96重量份、97重量份、98重量份或99重量份的量存在于（甲基）丙稀酸类聚合物中。  Based on 100 parts by weight total monomer units or polymeric meter, (meth) acrylic acid alkyl ester monomer is generally at least 85 parts by weight, 86 parts by weight, 87 parts by weight, 88 parts by weight, 89 parts by weight or 90 parts by weight, up to 95 parts by weight, 96 parts by weight, 97 parts by weight, 98 parts by weight 99 parts by weight or is present in an amount of (meth) acrylic acid-based polymer. 当压敏粘合剂包含高Tg单体时，粘合剂可包含至少5重量份、10重量份、15重量份、20重量份至30 重量份的此类高Tg单体。 When the pressure sensitive adhesive comprises a high Tg monomer, the binder may comprise at least 5 parts by weight, 10 parts by weight, 15 parts by weight, 20 parts by weight to 30 parts by weight of a high Tg of such monomers. 当（例如，压敏）粘合剂组合物不含未聚合组分，诸如增粘剂、二氧化硅和玻璃泡时，总单体或聚合单元的重量份大约与总粘合剂组合物中存在的重量％相同。 When (e.g., pressure-sensitive) adhesive composition is free of non-polymerizable components, such as a tackifier, silica and glass bubbles, parts by weight total monomer units or polymeric about the total adhesive composition wt% present in the same. 然而，当（例如，压敏）粘合剂组合物包含此类未聚合组分时，（例如，压敏）粘合剂组合物可包含显著少的（甲基）丙烯酸烷基酯单体和交联单体。 However, when (e.g., pressure-sensitive) adhesive compositions comprising such unpolymerized min, (e.g., pressure-sensitive) adhesive composition may comprise significantly less (meth) acrylate monomer and crosslinking monomer. （例如，压敏）粘合剂组合物包含至少50重量％的衍生自（甲基）丙烯酸烷基酯单体的聚合单元。 (E.g., pressure-sensitive) adhesive composition comprises at least 50% by weight of units derived from (meth) acrylic acid alkyl ester monomer polymerized units. 在一些实施例中，压敏粘合剂组合物包含基于100重量份的总单体（或总粘合剂组合物的重量％ )计的至少50 重量份、55重量份、60重量份、65重量份、70重量份、75重量份、80重量份、85重量份或90 重量份的一种或多种低Tg单体。 In some embodiments, the pressure sensitive adhesive composition comprises (% by weight or the total adhesive composition) of at least 50 parts by weight, 55 parts by weight, 60 parts by weight based on 100 parts by weight of the total monomers, 65 parts by weight, 70 parts by weight, 75 parts by weight, 80 parts by weight, 85 parts by weight or 90 parts by weight of one or more low Tg monomer. 对于其中粘合剂不是压敏粘合剂的一些实施方法，粘合剂可包含基于100重量份的总单体（或总粘合剂组合物的重量％ )计的至少50重量份、55重量份、60重量份、65重量份、70重量份、75重量份、80重量份、85重量份或90重量份的一种或多种高Tg单体。 For some of the method embodiments wherein the adhesive is not a pressure sensitive adhesive, the adhesive may comprise (% by weight or the total adhesive composition) is at least 50 parts by weight basis based on 100 parts by weight of the total monomer, 55 wt parts, 60 parts by weight, 65 parts by weight, 70 parts by weight, 75 parts by weight, 80 parts by weight, 85 parts by weight or 90 parts by weight of one or more high Tg monomers. （甲基）丙稀酸类聚合物可任选地包含酸性官能单体（高Tg单体的子组），其中酸性官能团可为酸本身，诸如羧酸，或者一部分可为其盐，诸如碱金属羧酸盐。 (Meth) acrylic polymer may optionally contain acid functional monomer (a subset of a high Tg monomer), wherein the acidic functional group may be an acid per se, such as a carboxylic acid, or a portion may be salt thereof, such as an alkali metal carboxylates. 可用的酸性官能单体包括但不限于选自烯键式不饱和羧酸、烯键式不饱和磺酸、烯键式不饱和膦酸、以及它们的混合物的那些。 Available acid functional monomers include, but are not limited to those selected from ethylenically unsaturated carboxylic acids, ethylenically unsaturated sulfonic acids, ethylenically unsaturated phosphonic acids, and mixtures thereof. 此类化合物的示例包括选自丙烯酸、甲基丙烯酸、衣康酸、富马酸、巴豆酸、柠康酸、马来酸、油酸、（甲基）丙烯酸(6-羧乙酯、甲基丙烯酸2-磺乙酯、苯乙烯磺酸、2-丙烯酰胺基-2-甲基丙烷磺酸、乙烯基膦酸以及它们的混合物的那些。 Examples of such compounds include those selected from acrylic acid, methacrylic acid, itaconic acid, fumaric acid, crotonic acid, citraconic acid, maleic acid, oleic acid, (meth) acrylic acid (6-carboxyethyl methacrylate, those acrylate, 2-sulfoethyl methacrylate, styrene sulfonic acid, 2-acrylamido-2-methylpropanesulfonic acid, vinylphosphonic acid, and mixtures thereof. 由于它们的可用性，酸性官能单体一般选自烯键式不饱和羧酸，S卩（甲基）丙烯酸。  Due to their availability, acid functional monomers are generally selected from ethylenically unsaturated carboxylic acid, S Jie (meth) acrylic acid. 当需要甚至更强的酸时，酸性单体包括烯键式不饱和磺酸和烯键式不饱和膦酸。 When even stronger acids are required, acidic monomers include the ethylenically unsaturated sulfonic acids and ethylenically unsaturated phosphonic acids. 在一些实施例中，基于100重量份的总单体或聚合单元，酸性官能单体通常以〇. 5重量份至15 重量份，优选地以〇. 5重量份至10重量份的量使用。 In some embodiments, based on 100 parts by weight total monomer units or polymeric, acid functional monomer is generally square. 5 parts by weight to 15 parts by weight, preferably in an amount billion. 5 parts by weight to 10 parts by weight is used. 在一些实施例中，（甲基）丙烯酸类聚合物和/ 或PSA包含小于1. 0、0. 9、0. 8、0. 7、0. 6、0. 5、0. 4、0. 3、0. 2、0. 1 或0 重量％ 的衍生自酸性官能单体诸如丙稀酸的聚合单元。 In some embodiments, the (meth) acrylic polymer and / or PSA comprises less than 1. 0,0. 9,0. 8,0. 7,0. 6,0. 5,0. 4,0. 3,0. 2,0. 1, or 0% by weight of units derived from acid functional monomers such as acrylic polymerized units of. (甲基）丙稀酸类共聚物可任选地包含其它单体，诸如非酸性官能极性单体。  (meth) acrylic acid-based copolymer may optionally comprise other monomers, such as non-acid functional polar monomers. 合适的极性单体的代表性示例包括但不限于（甲基）丙烯酸2-羟乙酯；N-乙烯基吡咯烷酮；N-乙烯基己内酰胺；丙烯酰胺；单N-烷基或双N-烷基取代的丙烯酰胺；叔丁基丙烯酰胺；二甲基氨乙基丙烯酰胺；N-辛基丙烯酰胺；（甲基）丙烯酸聚（烷氧基烷基）酯， 包括（甲基）丙烯酸2-(2-乙氧基乙氧基）乙酯、（甲基）丙烯酸2-乙氧基乙酯、（甲基） 丙烯酸2-甲氧基乙氧基乙酯、甲基丙烯酸2-甲氧基乙酯、聚乙二醇单（甲基）丙烯酸酯； 烷基乙烯基醚，包括乙烯基甲基醚；以及它们的混合物。  Representative examples of suitable polar monomers include, but are not limited to (meth) acrylate, 2-hydroxyethyl methacrylate; N- vinyl pyrrolidone; N- vinylcaprolactam; acrylamide; N- mono-alkyl or bis N- alkyl-substituted acrylamides; tert-butylacrylamide; dimethylaminoethyl acrylamide; N- octyl acrylamide; (meth) acrylate, poly (alkoxyalkyl) acrylate, including (meth ) 2- (2-ethoxyethoxy) ethyl (meth) acrylate, 2-ethoxyethyl (meth) acrylate, 2-methoxy ethoxy ethyl methacrylate, 2 - methoxyethyl acrylate, polyethylene glycol mono (meth) acrylate; alkyl vinyl ethers, including vinyl methyl ether; and mixtures thereof. 优选的极性单体包括选自（甲基） 丙烯酸-2-羟乙酯和N-乙烯基吡咯烷酮的那些。 Preferred polar monomers include those selected from (meth) acrylate, 2-hydroxyethyl methacrylate and N- vinylpyrrolidone. 基于100重量份的总单体，非酸性官能极性单体可以〇重量份至10重量份或20重量份，或0. 5重量份至5重量份的量存在。 100 parts by weight based on total monomer, non-acid functional polar monomers can billion parts by weight to 10 parts by weight or 20 parts by weight, or 0.5 parts by weight to 5 parts by weight is present. 在一些实施例中，（甲基）丙烯酸类聚合物和/或PSA包含小于1.0重量％、0.9重量％、0.8重量％、0. 7重量％、0. 6重量％、0. 5重量％、0. 4重量％、0. 3重量％、0. 2重量％、0. 1重量％ 或〇重量％的衍生自非酸极性单体的聚合单元。 In some embodiments, the (meth) acrylic polymer and / or PSA comprises less than 1.0 wt%, 0.9 wt%, 0.8 wt%, 0.7 wt%, 0.6 wt%, 0.5 wt%, 0.4 wt.%,%, 0.2 wt%, 0.1 wt% or wt% square of 0.3 wt derived from a non-acid polar monomer polymerized units. 当使用时，可用于（甲基）丙烯酸酯聚合物的乙烯基单体包括乙烯基酯（例如，乙酸乙烯酯和丙酸乙烯酯）、苯乙稀、取代的苯乙烯（例如，a-甲基苯乙烯）、乙烯基卤化物、 以及它们的混合物。  When used, may be used (meth) acrylic ester polymer of vinyl monomers include vinyl esters (e.g., vinyl acetate and vinyl propionate), Styrene, substituted styrenes (e.g., a- methylstyrene), vinyl halides, and mixtures thereof. 如本文所用，乙烯基单体不包括酸性官能单体、丙烯酸酯单体和极性单体。 As used herein, the vinyl monomer does not include acid functional monomers, acrylate monomer and a polar monomer. 基于100重量份的总单体或聚合单元，此类乙烯基单体通常以〇重量份至5重量份，优选地以1重量份至5重量份的量使用。 Based on 100 parts by weight total monomer units or polymeric, such vinyl monomers generally square in parts by weight to 5 parts by weight, preferably in an amount of 1 part by weight to 5 parts by weight is used. 在一些实施例中，（甲基）丙烯酸类聚合物和/或PSA包含小于I. 0重量％、0. 9重量％、0. 8重量％、0. 7重量％、0. 6重量％、0. 5重量％、0. 4 重量％、0. 3重量％、0. 2重量％、0. 1重量％或0重量％的衍生自乙烯基单体的聚合单元。 In some embodiments, the (meth) acrylic polymer and / or PSA comprises less than I. 0 wt%, 0.9 wt%, 0.8 wt%, 0.7 wt%, 0.6 wt%, 0.5 wt%, 0.4 wt%, 0.3 wt%, 0.2 wt%, or 0% by weight of polymerized units of% 0.1 wt units derived from vinyl monomers. 在一些实施例中，聚合物不含有烯丙基醚、乙烯基醚或乙烯基酯单体单元。  In some embodiments, the polymer does not contain an allyl ether, vinyl ether or vinyl ester monomer units. R2为C6-C2。  R2 is a C6-C2. 烯烃基团，该烯烃基团任选地被取代。 Alkene group, an olefinic group which is optionally substituted. 对于其中交联单体包含（例如，二价）连接基团的实施例，该连接基团（即，L) 通常具有不大于l〇〇〇g/mol，并且在一些实施例中不大于500g/mol、400g/mol、300g/mol、 200g/mol、100g/mol或50g/mol的分子量。  wherein the crosslinking monomer comprises respect (e.g., divalent) Example linking group, the linker group (i.e., L) have generally no greater than l〇〇〇g / mol, and in some embodiments the not more than 500g / mol, a molecular weight of 400g / mol, 300g / mol, 200g / mol, 100g / mol or 50g / mol of. 其中R4和R5为H，并且R3为H或（例如C^C4)烷基。  wherein R4 and R5 are H, and R3 is H or (e.g. C ^ C4) alkyl. （甲基）丙烯酸十一碳烯酯包含此类末端不饱和基团。 (Meth) acrylate, undecenyl acrylate containing such terminal unsaturated group. 其中R4和R5独立地为烷基，并且R3为H或（例如C1-C4)烷基。  wherein R4 and R5 are independently alkyl, and R3 is H or (e.g. C1-C4) alkyl. 在一些实施例中， R4和R5各自为甲基。 In some embodiments, R4 and R5 are each methyl. 在该实施例中，R4或R5SC6-C2。 In this embodiment, R4, or R5SC6-C2. 烯烃基团的末端烷基基团。 Terminal olefin group is an alkyl group. 香茅（甲基）丙烯酸酯、（甲基）丙烯酸香叶酯和（甲基）丙烯酸金合欢酯包含这种类型的烃不饱和基团。 Citronella (meth) acrylate, (meth) acrylic acid, geranyl acetate, and (meth) acrylate ester containing this type of acacia unsaturated hydrocarbon group. 在一些实施例中，交联单体包含（甲基）丙烯酸酯基团和任选地取代的C6-C2。  In some embodiments, the crosslinking monomer comprises (meth) acrylate groups, and optionally substituted C6-C2. 烯烃基团，该烯烃基团在主链中包含两个或更多个烃不饱和基团。 Alkene group, the olefin group contains two or more unsaturated groups in the hydrocarbon backbone. 一些例示性交联单体包括例如（甲基）丙烯酸香叶酯（例如，3,7_二甲基辛-2, 6-二烯基]丙基-2-烯酸酯）和（甲基）丙烯酸金合欢酯（例如，3, 7, 11-三甲基十二-2, 6, 10-三烯基]丙基-2-烯酸酯）。 Some illustrative crosslinking monomers include, for example, (meth) acrylate, geranyl ester (e.g., dimethyl octyl 3,7_-2,6-diene-yl] propyl 2-enoate) and (meth) acacia acrylate esters (e.g., 3, 7, 11-trimethyl-dodeca-2, 6, 10- trien-yl] propyl-2-enoate). 在任选地取代的C6-C2。  In the optionally substituted C6-C2. 烯烃基团的主链中的烃不饱和基团的另一个实施例中，R3 和R4独立地为H或（例如，C「C4)烷基，并且R5为具有至多18个碳原子的末端烷基基团。 (甲基）丙烯酸油酯包含这种类型的烃不饱和基团。 Another main alkene group in the unsaturated hydrocarbon group of embodiments, R3 and R4 are independently H or embodiments (e.g., C "C4) alkyl, and R5 having up to 18 carbon atoms, an alkoxy terminus group. (meth) acrylate containing a hydrocarbon oil acrylate of this type unsaturated group. 在典型实施例中，取代的C6-C2。  In an exemplary embodiment, the substituted C6-C2. 烯烃基团不包含羰基基团。 Olefin group does not contain a carbonyl group. 因此，（甲基）丙烯酸酯基团是包含羰基基团的交联单体的唯一基团。 Thus, (meth) acrylate groups are the only crosslinking monomers comprising a group a carbonyl group. 因此，交联单体不含其它基团，这些其它基团包含羰基，诸如醛、酮、羧酸、酯、酰胺、烯酮、酰卤、酸酐和酰亚胺。 Accordingly, the crosslinking monomer is free of other groups, which other groups containing a carbonyl group, such as aldehydes, ketones, carboxylic acids, esters, amides, ketene, acid halides, acid anhydrides and imides. 因此，交联单体包含两种类型的聚合型官能团或由其组成，即，单（甲基）丙烯酸酯基团和一种或多种烃不饱和基团。 Accordingly, the crosslinking monomer contains two types of polymerizable functional groups, or consist of, i.e., mono (meth) acrylate groups and one or more unsaturated hydrocarbon group. 任选地取代的C6-C2。  optionally substituted C6-C2. 烯烃基团可为直链的、支链的，或环状的。 The olefin group may be linear, branched, or cyclic. 另外，烃不饱和基团可处于任何位置。 Further, an unsaturated hydrocarbon group may be in any position. 当交联单体包含单烃不饱和基团时，未取代C6-C2。  When the crosslinking monomer comprises mono-unsaturated hydrocarbon group, an unsubstituted C6-C2. 烯烃基团可表征为烯基基团。 Alkene group may be characterized as an alkenyl group. 在一些实施例中，烯基基团具有直链。 In some embodiments, the alkenyl group having a straight chain. 在一些实施例中，烯基基团具有支链，通常包含键合至直链的侧链甲基基团。 In some embodiments, a branched alkenyl group, typically comprises linear bonded to a side chain methyl group. 包含烯基基团的一些例示性交联单体包括香茅（甲基）丙烯酸酯、3-环己烯甲基(甲基）丙烯酸酯、（甲基）丙烯酸十一碳烯酯和丙烯酸油酯。  Some illustrative crosslinking monomer comprises citronella alkenyl groups include (meth) acrylate, 3-cyclohexenyl methyl (meth) acrylate, (meth) acrylate, undecenyl acrylate and oleyl acrylate. 其它C6-C2。 Other C6-C2. 烯基基团包括1-己烯基、2-己烯基、3-己烯基、4-己烯基、5-己烯基、1-甲基-1-戊烯基、2-甲基-1-戊烯基、3_甲基-1-戊烯基、4_甲基-1-戊烯基、1-甲基_2_戊烯基、2_甲基_2_戊烯基、3_甲基-2_戊烯基、4_甲基_2_戊烯基、1-甲基_3_戊烯基、2_甲基_3_戊烯基、3_甲基_3_戊烯基、4-甲基-3-戊烯基、1-甲基-4-戊烯基、2-甲基-4-戊烯基、3-甲基-4-戊烯基、 4-甲基-4-戊烯基、1，1-二甲基-2-丁烯基、1，1-二甲基-3-丁烯基、1，2-二甲基-1-丁烯基、1，2_二甲基_2_ 丁烯基、1，2_二甲基_3_ 丁烯基、1，3_二甲基-1-丁烯基、1，3_二甲基_2_ 丁烯基、1，3_二甲基_3_ 丁烯基、2, 2_二甲基_3_ 丁烯基、2, 3_二甲基-1-丁稀基、2, 3_二甲基_2_ 丁烯基、2, 3_二甲基_3_ 丁烯基、3, 3_二甲基-1-丁烯基、3, 3_二甲基_2_ 丁烯基、1，1，2-二甲基_2_丙烯基；并还包括庚烯基、辛烯基和壬烯基的异构体。 Alkenyl groups include 1-hexenyl, 2-hexenyl, 3-hexenyl, 4-hexenyl, 5-hexenyl, 1-methyl-1-pentenyl, 2-methyl 1-pentenyl, 1-pentenyl methyl 3_, 4 _-methyl-1-pentenyl, 1-methyl _2_ pentenyl group, pentenyl group 2_ methyl _2_ , methyl -2_ pentenyl group 3_, 4_ methyl _2_ pentenyl, 1-methyl _3_ pentenyl group, pentenyl group _3_ 2_ methyl, methyl 3_ _ 3_ pentenyl, 4-methyl-3-pentenyl, 1-methyl-4-pentenyl, 2-methyl-4-pentenyl, 3-methyl-4-pentenyl, methyl-4-pentenyl, 1,1-dimethyl-2-butenyl, 1,1-dimethyl-3-butenyl, 1,2-dimethyl-1- alkenyl, 1,2_ dimethyl _2_ butenyl, 1,2_ dimethyl _3_ butenyl, 1-butenyl dimethyl 1,3_, 1,3_ dimethyl _2_ butenyl, 1,3_ dimethyl _3_ butenyl, 2-butenyl 2_ dimethyl _3_, 2, 3_ dilute dimethyl-1-yl, 2, 3_ _2_ dimethyl-butenyl, 2, 3_ dimethyl _3_ butenyl, 3, 3_-dimethyl-1-butenyl, 3-dimethyl-3_ _2_ butenyl, 1 , 1,2-dimethyl-propenyl _2_; and also includes isomers heptenyl, octenyl and nonenyl group. 环状烯基基团包括环己烯基以及二环戊二烯。  cyclic alkenyl groups include cyclohexenyl and dicyclopentadiene. 前体条件是C6-C2。  with the proviso that C6-C2. 烯烃基团包含至少一个烃不饱和基团，C6-C2。 The olefin group contains at least one unsaturated hydrocarbon group, C6-C2. 烯烃基团可任选地包含取代基。 The olefin group can optionally contain substituents. 取代基选择成使得交联单体包含可用于交联的至少一个烃不饱和基团，通过剪切值的可测量和优选显著增大是明显的。 Substituent group selected so that the crosslinking monomer contains at least one unsaturated hydrocarbon groups for crosslinking can be significantly increased by the preferred measure and shear values ​​is evident. 在一些实施例中，C6-C2。  In some embodiments, C6-C2. 烯烃基团包含侧链取代基。 The olefin group contains side-chain substituents. 例如，当C6-C2。 For example, when the C6-C2. 烯烃基团包含两个或更多个烃不饱和基团时，附加烃不饱和基团中的一个或多个可反应以将侧链取代基附加至C6-C2。 The olefin group contains two or more unsaturated hydrocarbon group, an unsaturated hydrocarbon group attached to one or more of the substituents may be reacted to attach a side chain group to C6-C2. 烯烃基团主链上。 Main chain alkene group. 交联单体可通过以下方式制备：使对应醇与丙烯酰氯、二氯甲烷和三乙胺、或它们的组合（诸如实例中所示）反应。  The crosslinking monomers may be prepared in the following way: of the corresponding alcohol with acryloyl chloride, triethylamine and dichloromethane, or combinations thereof (such as shown in the examples) reaction. 交联单体还可通过与丙烯酸的直接酯化而制备。 Crosslinking monomers may also be prepared by the direct esterification of acrylic acid. 在一些实施例中，交联单体包含具有小于18、或16、或14、或12个碳原子的支链C6-C2。  In some embodiments, the crosslinking monomer comprises less than 18, or 16, or 14, or 12 branched chain carbon atoms, C6-C2. ，诸如就香茅丙烯酸酯和丙烯酸香叶酯而言。 , Such as in terms citronellyl acrylate and geranyl acetate concerned. 在该实施例中，压敏粘合剂可获得为具有高剪切值（即，在70°C下大于1000分钟）与高粘合力以及少至0.5重量％的此类交联单体。 In this embodiment, the pressure sensitive adhesive is obtained having high shear values ​​(i.e., greater than at 70 ° C 1000 min) and a high adhesive force with little to 0.5% by weight of such crosslinking monomers. 随着支链C6-C2。 With a branched C6-C2. 基团的链长度增加，需提供相同数量交联的交联单体的量增加。 Group chain length increases, the amount of crosslinking monomer is the same as the amount of crosslinking required increases. 例如， 就丙烯酸金合欢酯而言，至少〇. 7重量％或0. 8重量％导致高剪切值。 For example, in an acrylic ester, of acacia, square at least 7 wt.% Or 0.8 wt% results in a high shear values. 就环状C6-C2。 For cyclic C6-C2. 烯烃基团而言，诸如就环己烷甲基丙烯酸酯而言，至少2重量％、3重量％、4重量％或5重量％ 导致高剪切值。 For alkene group, such as on the cyclohexane methacrylate, the at least 2 wt%, 3 wt%, 4 wt%, or 5 wt% results in a high shear values. 就包含直链C6-C2。 It contains a linear C6-C2. 的交联单体而言，诸如就丙烯酸十一碳烯酯和丙烯酸油酯而言，以约1重量％获得高剪切值与高粘合力。 For cross-linking monomer, such as acrylic acid to undecenyl acrylate and oleate, the about 1 wt% to obtain a high adhesive forces and shear values. 据推测，较低浓度的丙烯酸十一碳烯酯和任选地取代的丙烯酸油酯也提供性质的良好平衡。 Presumably, the lower the concentration of acrylic acid ester-undecene and optionally substituted acrylate ester oil provides a good balance of properties. (例如，压敏）粘合剂组合物可包含单交联单体或两个或更多个此类交联单体的组合，该交联单体包含（甲基）丙烯酸酯基团和（任选地取代的）C6-CJt烃基团。  (e.g., pressure-sensitive) adhesive composition may comprise a combination of a crosslinking monomer alone or two or more such crosslinking monomer, the crosslinking monomer comprises (meth) acrylate groups group and (optionally substituted) C6-cJt hydrocarbon group. 另外， 交联单体可包含相同通式结构的两个或更多个异构体。 Further, a crosslinking monomer can comprise two or more isomers of the same general structure. 在有利的实施例中，交联粘合剂组合物包含对不锈钢或橘皮干燥壁的高剪切值， 即，在70°C下大于10000分钟，如根据实例中所描述的方法测定。  In an advantageous embodiment, the adhesive composition comprising a crosslinked high shear dried orange peel value or stainless steel wall, i.e., greater than at 70 ° C 10000 minutes according to the method as described in Example Determination. 根据预期的最终用途，交联压敏粘合剂可表现出各种剥离粘附力值。 Depending on the intended end use, the crosslinked pressure sensitive adhesive may exhibit various peel adhesion value. 在一些实施例中，对不锈钢的180°度剥离粘附力为至少15N/dm。 In some embodiments, a 180 ° degree peel adhesion to stainless steel of at least 15N / dm. 在其它实施例中，对不锈钢的180°度剥离粘附力为至少20N/dm、25N/ dm、30N/dm、35N/dm、40N/dm、45N/dm、50N/dm、55N/dm、60N/dm、65N/dm、70N/dm、或75N/dm。 In other embodiments, a 180 ° degree peel adhesion to stainless steel of at least 20N / dm, 25N / dm, 30N / dm, 35N / dm, 40N / dm, 45N / dm, 50N / dm, 55N / dm, 60N / dm, 65N / dm, 70N / dm, or 75N / dm. 对不锈钢的180°度剥离粘附力通常不大于150N/dm或100N/dm。 For 180 ° peel adhesion of the stainless steel usually not more than 150N / dm or 100N / dm. 此类剥离粘附力值也可在粘合至其它基材时获得。 Such peel adhesion values ​​may also be obtained when bonded to other substrates. 在一些实施例中，诸如就任选地取代的香茅（甲基）丙烯酸酯和（甲基）丙烯酸油酯而言，交联单体为生物基材料。  In some embodiments, such as in terms of citronella optionally substituted (meth) acrylate and (meth) acrylic acid ester oil, the crosslinking monomer is a bio-based material. 因此，此类交联单体的使用可服从于增加粘合剂的生物基材料的总含量。 Thus, use of such a crosslinking monomer may be subject to an increase in the total content of the bio-based binder material. 另外，因为交联单体包含含有至少6个碳原子的烯烃基团，所以当烃不饱和基团不交联时，交联单体可起到低Tg单体的作用。 Furthermore, because the crosslinking monomer comprises an olefin-containing group having at least 6 carbon atoms, an unsaturated hydrocarbon when the groups are not crosslinked, a crosslinking monomer may function as a low Tg monomer. 这可服从于利用较高浓度的此类交联单体。 This use may be subject to higher concentrations of such crosslinking monomers. 另外，交联单体不形成腐蚀性副产物并且具有良好的颜色稳定性。 Further, a crosslinking monomer does not form corrosive by-products and has good color stability. 在一些实施例中， 粘合剂在暴露于UV或热之后的K(如实例中所描述的测试方法中更详细地描述）小于1、 或0. 9、或0. 8、或0. 7、或0. 6、或0. 5、或0. 4、或0. 3。 In some embodiments, the adhesive K after exposure to UV or heat (as described in the test method described in the examples in more detail below) is less than 1, or 0.9, or 0.8, or 0.7 , or 0.6, or 0.5, or 0.4, or 0.3. 在一些实施例中，粘合剂在暴露于UV 或热之后的K(如实例中所描述的测试方法中更详细地描述）小于2、或1. 5、或1、或0. 9、 或0. 8、或0. 7、或0. 6、或0. 5、或0. 4、或0. 3。 In some embodiments, the binder after exposure to heat or UV K (as described in the test method described in the examples in more detail below) is less than 2, or 1.5, or 1, or 0.9, or 0.8, or 0.7, or 0.6, or 0.5, or 0.4, or 0.3. (例如，压敏）粘合剂可任选地包含除了所述交联剂（其具有（甲基）丙烯酸酯基团和任选地取代的C6-C2。烯烃基团）之外的另一种交联剂。  (e.g., pressure-sensitive) adhesive can optionally include in addition to the crosslinking agent (which has a (meth) acrylate groups, and optionally substituted C6-C2. Olefinic group) outside another cross-linking agent. 在一些实施例中，（例如，压敏）粘合剂包含多官能（甲基）丙烯酸酯。 In some embodiments, (e.g., pressure-sensitive) adhesive comprising a polyfunctional (meth) acrylate. 可用的多官能（甲基）丙烯酸酯的示例包括但不限于二（甲基）丙烯酸酯、三（甲基）丙烯酸酯和四（甲基）丙烯酸酯，诸如1，6_己二醇二（甲基）丙烯酸酯、聚（乙二醇）二（甲基）丙烯酸酯、聚丁二烯二（甲基）丙烯酸酯、 聚氨酯二（甲基）丙烯酸酯和丙氧基化甘油三（甲基）丙烯酸酯、以及它们的混合物。 Examples of the polyfunctional (meth) acrylate may be used include, but are not limited to di (meth) acrylate, pentaerythritol tri (meth) acrylate and tetra (meth) acrylates, such as hexanediol di 1,6_ ( meth) acrylate, poly (ethylene glycol) di (meth) acrylate, polybutadiene di (meth) acrylate, polyurethane di (meth) acrylates, and propoxylated glycerin tri (meth ) acrylates, and mixtures thereof. -般来讲，多官能（甲基）丙烯酸酯不是初始单体混合物的一部分，但在形成（甲基）丙稀酸类聚合物之后随后添加。  - generally speaking, a portion of the polyfunctional acrylate monomer is not the initial mixture of (meth), but after forming the (meth) acrylic acid-based polymer was then added. 如果使用，则基于1〇〇重量份的总单体含量计，多官能(甲基）丙烯酸酯通常以至少〇. 01重量份、〇. 02重量份、0. 03重量份、0. 04重量份或0. 05 重量份，至多达1重量份、2重量份、3重量份、4重量份或5重量份的量使用。 If used, based on parts by weight of 1〇〇 total monomer content, the polyfunctional (meth) acrylate is generally square at least 01 parts by weight, square 02 parts by weight, 0.03 parts by weight, 0.04 wt. parts or 0.05 parts by weight, up to 1 parts by weight, 2 parts by weight, 3 parts by weight, 4 parts by weight or 5 parts by weight of the amount. 在一些实施例中，（例如，压敏）粘合剂还可包含氯化三嗪交联化合物。  In some embodiments, (e.g., pressure-sensitive) adhesive can also comprise chlorinated triazine crosslinking compound. 三嗪交联剂可具有下式。 Triazine crosslinking agent may have the formula. 其中该三嗪交联剂的HM5PR4独立地为氢或烷氧基基团，并且R1UdPR4 中的1至3个为氢。  wherein the triazine HM5PR4 independently hydrogen or alkoxy group of the crosslinking agent, and R1UdPR4 of 1-3 hydrogen. 烷氧基基团通常具有不大于12个碳原子。 Alkoxy groups typically having not more than 12 carbon atoms. 在有利的实施例中，烷氧基基团独立地为甲氧基或乙氧基。 In an advantageous embodiment, the alkoxy group is independently methoxy or ethoxy. 一种代表性物质为2, 4，-双（三氯甲基）-6-(3, 4-双（甲氧基）苯基）-三嗪。 A representative material is 2, 4 - bis (trichloromethyl) -6- (3, 4-bis (methyloxy) phenyl) - triazine. 此类三嗪交联化合物还描述于US 4, 330, 590中。 Such triazine crosslinking compounds are also described in US 4, 330, 590. 在一些实施例中，（例如，压敏）粘合剂主要地包含来自该交联单体的（大于50%、60%、70%、80%或90%的总交联）或唯一地交联，该交联单体包含（甲基）丙烯酸酯基团和任选地取代的C6-C2。  In some embodiments, (e.g., pressure-sensitive) adhesive comprises mainly from the crosslinking monomer (greater than 50%, 60%, 70%, 80% or 90% of the total cross-linking), or uniquely crosslinked, the crosslinking monomer comprises (meth) acrylate groups, and optionally substituted C6-C2. 烯烃基团。 Olefinic groups. 在此类实施例中，（例如，压敏）粘合剂可不含其它交联化合物，尤其是氮丙啶交联剂，以及多官能（甲基）丙烯酸酯交联剂、氯化三嗪交联剂和三聚氰胺交联剂。 In such embodiments, (e.g., pressure-sensitive) adhesive can be free of other crosslinking compounds, in particular triazine aziridine crosslinking agent, and a polyfunctional (meth) acrylate, a crosslinking agent, cross chloride a melamine crosslinking agent and a crosslinking agent. (甲基）丙稀酸类共聚物和粘合剂组合物可以通过以下各种技术聚合，包括但不限于溶剂聚合、分散聚合、无溶剂型本体聚合，和辐射聚合（包括使用紫外光、电子束和Y 辐射的工艺）。  (meth) acrylic acid copolymers and adhesive compositions may be polymerized by various techniques, including but not limited to solvent polymerization, dispersion polymerization, solventless bulk polymerization, and radiation polymerization (including the use of ultraviolet light, electron beam irradiation process, and Y). 单体混合物可包含聚合引发剂，尤其是热引发剂或光引发剂类型，并且是以有效聚合共聚单体的量。 The monomer mixture may contain a polymerization initiator, especially a thermal initiator or photoinitiator type and in an amount effective to polymerize the comonomers. 典型的溶液聚合方法是通过如下方式进行的：向反应容器添加单体、合适的溶剂和任选的链转移剂，添加自由基引发剂，用氮气吹扫，并保持反应蓉器处于升高的温度下(例如，约40°C至KKTC)直至反应完成，取决于批量大小和温度通常为约1至20小时。  A typical solution polymerization method is carried out by: adding monomers to the reaction vessel, a suitable solvent and optionally a chain transfer agent, adding a free radical initiator, purging with nitrogen, and maintaining the reaction is in Rong at elevated temperature (e.g., about 40 ° C to KKTC) until the reaction was complete, depending on the batch size and temperature is usually from about 1 to 20 hours. 典型溶剂的示例包括甲醇、四氢呋喃、乙醇、异丙醇、丙酮、甲基乙基酮、乙酸甲酯、乙酸乙酯、 甲苯、二甲苯和乙二醇烷基醚。 Typical examples of the solvent include methanol, tetrahydrofuran, ethanol, isopropanol, acetone, methyl ethyl ketone, methyl acetate, ethyl acetate, toluene, xylene, and glycol alkyl ethers. 可单独或者作为其混合物使用这些溶剂。 These solvents may be used alone or as a mixture thereof. 可用的引发剂包括在暴露于热或光时生成引发单体混合物的（共）聚合的自由基的那些。  Useful initiators include those (co) polymerization of free-radical generating initiator is exposed to heat or light when the monomer mixture. 引发剂通常以约0. 0001至约3. 0重量份、优选地约0. 001至约I. 0重量份，更优选地约0. 005至约0. 5重量份的总单体或聚合单元的浓度范围使用。 Initiator is typically from about 0.0001 to about 3.0 parts by weight, preferably from about 0.001 to about 0 parts by weight of I., from about 0.005 parts to about 0.5 and more preferably the total weight of the polymerizable monomers or unit using a range of concentrations. 合适的引发剂包括但并不限于选自偶氮化合物（诸如购自杜邦公司（EIduPont (^恥111〇1^8(：〇. )的¥厶2064(2,2'-偶氮二（异丁腈））、¥厶20 52(2,2'-偶氮二（2,4-二甲基戊腈））和VAZO67 (2, 2'-偶氮二（2-甲基丁腈）））、过氧化物（诸如过氧化苯甲酰和过氧化月桂酰）以及它们的混合物的那些。优选的油溶性热引发剂是（2, 2'-偶氮二-(2-甲基丁腈））。当使用引发剂时，基于压敏粘合剂中100重量份的单体组分计，引发剂可占约0. 05重量份至约1重量份，优选地占约0. 1重量份至约0. 5重量份。  Suitable initiators include, but are not limited to those from the azo compound (such as commercially available from DuPont (EI duPont (shame 111〇1 ^ 8 ^ (: square) of 2064 ¥ Si (2,2'-azobis bis (isobutyronitrile)), Si ¥ 2052 (2,2'-azobis (2,4-dimethylvaleronitrile)) and VAZO67 (2, 2'- azobis (2-methylbut nitrile))), a peroxide (such as benzoyl peroxide and lauroyl peroxide), and mixtures thereof as those preferred oil soluble thermal initiator is (2,2'-azobis - (2- butyronitrile)). when the initiator is used, based on 100 parts by weight of the monomer constituents of the pressure-sensitive adhesive, initiators may comprise from about 0.05 to about 1 parts by weight parts by weight, preferably about 0 parts. 1 by weight to about 0.5 parts by weight. 由溶液聚合制备的聚合物具有侧链不饱和基团，该侧链不饱和基团可通过多种方法进行交联。  The polymer solution prepared by a polymerization of unsaturated group having a side chain, the pendant unsaturated group can be crosslinked by various methods. 这些方法包括添加热引发剂或光引发剂，然后在涂布之后热暴露或UV暴露。 These methods include adding a thermal initiator or a photoinitiator, and thermal exposure or after UV exposure the coating. 聚合物还可通过暴露于电子束或Y照射进行交联。 Polymers may also be crosslinked by exposure to electron beam irradiation or Y. 一种制备（甲基）丙烯酸类聚合物的方法包括部分地聚合单体以产生包含溶质(甲基）丙烯酸类聚合物和一种或多种未聚合溶剂单体的浆料组合物。 Method  A process for preparing (meth) acrylic polymer comprises partially polymerizing monomers to produce a solute comprising a (meth) acrylic polymer and one or more solvent slurry composition unpolymerized monomer . 该一种或多种未聚合溶剂单体通常包含与用于产生溶质（甲基）丙稀酸类聚合物所用相同的单体。 The one or more solvents typically comprise unpolymerized monomers used to generate a solute (meth) acrylic acid-based polymer with the same monomers. 如果单体中的一些在（甲基）丙稀酸类聚合物的聚合期间被消耗，则一种或多种未聚合溶剂单体包含与用于产生溶质（甲基）丙稀酸类聚合物所用相同的单体中的至少一些。 If the number is consumed during polymerization of (meth) acrylic acid-based polymer in the monomer, one or more of the unpolymerized monomer comprises a solvent for the solute to produce (meth) acrylic-based polymer at least some of the same monomers employed. 另外，一旦已形成（甲基）丙稀酸类聚合物，则一种或多种相同单体或一种或多种其它单体可被添加至浆料。 Further, once it has been formed (meth) acrylic acid-based polymer, the same one or more monomers or one or more other monomers may be added to the slurry. 部分聚合提供了（甲基）丙烯酸类溶质聚合物在一种或多种自由基聚合型溶剂单体中的可涂覆型溶液。 It provides a partial polymerization of one or more free radical polymerizable monomers in a solvent coatable solution (meth) acrylic polymer solute. 然后，部分地聚合的组合物被涂布在合适的基材上并进一步聚合。 Then, the partially polymerized composition is applied and further polymerized on a suitable substrate. 在一些实施例中，交联单体被添加至用于形成（甲基）丙稀酸类聚合物的一种或多种单体。  In some embodiments, the crosslinking monomer is added to the monomers used to form one or more (meth) acrylic acid-based polymer. 另选地或除此之外，在已形成（甲基）丙稀酸类聚合物后，交联单体可被添加至浆料。 After Alternatively or in addition, the formed (meth) acrylic acid-based polymer, a crosslinking monomer may be added to the slurry. 交联剂的（甲基）丙烯酸酯基团和用于形成（甲基）丙稀酸类聚合物的其它（例如， (甲基）丙烯酸酯）单体优先地聚合，从而形成具有侧链C6-C2。 (Meth) acrylate groups and a crosslinking agent for forming the (meth) acrylic acid-based polymer other (e.g., (meth) acrylate) monomer is preferentially polymerized, thereby forming a side chain C6 -C2. 烯烃基团的丙烯酸主链。 Acrylic backbone olefinic group. 无意于受理论的束缚，据推测，侧链C6-CJt烃基团的碳碳双键的至少一部分在浆料的辐射固化期间彼此交联。 At least a portion intending to be bound by theory, it is speculated that the side chain C6-CJt carbon-carbon double bonds hydrocarbon radical crosslinking with one another during the radiation curing of the slurry. 其它反应机制也可能发生。 Other reaction mechanism may also occur. 浆料方法提供了优于溶剂或溶液聚合方法的优点；该浆料方法产生较高分子量的材料。  The method provides advantages over the slurry solvent or solution polymerization method; the slurry process produces higher molecular weight materials. 这些较高的分子量增加链缠结量，从而增加内聚强度。 These higher molecular weight increase in the amount of chain entanglement, thereby increasing the cohesive strength. 并且，交联间的距离可随高分子量浆料聚合物而变大，这使得表面上的润湿度增加。 The distance between the crosslinked polymer may be a slurry with a high molecular weight becomes large, which makes the wetting of the surface increasing. (甲基）丙烯酸酯溶剂单体的聚合可通过在光引发剂的存在下使浆料组合物暴露于能量来实现。  (meth) acrylate polymerizable monomer can be prepared by solvent slurry composition in the presence of a photoinitiator is exposed to energy to achieve. 在例如使用电离辐射来引发聚合的情况下，可不需要能量活化的引发剂。 In the case where, for example, ionizing radiation is used to initiate the polymerization, and may not require energy activated initiators. 通常，相对于100重量份的浆料，光引发剂可以至少〇. 0001重量份，优选地至少〇. 001重量份，更优选地至少0. 005重量份的浓度使用。 Typically, with respect to 100 parts by weight of the syrup, a photoinitiator may be square at least 0001 parts by weight, preferably at least billion. 001 parts by weight, of at least 0.005 parts by weight and more preferably concentrations. 制备浆料组合物的一个优选方法是光引发的自由基聚合。  The preferred method of preparing a slurry composition is photoinitiated free radical polymerization. 光聚合方法的优点在于1)不需要加热单体溶液，和2)当关掉活化光源时，光引发完全停止。 Advantages of the photopolymerization method is that 1) the monomer solution does not require heating, and 2) when the activating light source turned off, a photoinitiator stopped completely. 可进行达到可涂覆型粘度的聚合，使得单体向聚合物的转化率高达约30%。 Polymerization may be carried out to achieve a coatable viscosity such that up to about 30% monomer conversion to polymer. 当已经达到所需的转化率和粘度时， 可以通过移开光源和通过往溶液里鼓泡通入空气（氧）以猝灭传播的自由基来终止聚合。 When the desired conversion has been reached and viscosity, and can be removed by the light source was bubbled through the solution to air (oxygen) to the propagation of free radical quenchers to terminate the polymerization. 可以按常规方式在非单体溶剂中制备溶质聚合物并进行到高的转化率（聚合度）。 Solute polymer can be prepared in a conventional manner in a non-monomeric solvent and subjected to high conversion (degree of polymerization). 当使用溶剂（单体性或非单体性的）时，可以在形成浆料组合物之前或之后除去溶剂（例如通过真空蒸馏）。 When solvent (monomeric or non-monomeric), the solvent is removed may be formed (e.g., by vacuum distillation) either before or after the slurry composition. 尽管该工序为可接受的方法，涉及高度转化的官能聚合物的该工序并不优选， 因为需要附加的溶剂去除步骤，可能需要另一材料（非单体性溶剂），并且高分子量且高度转化的溶质聚合物在单体混合物中的溶解可能需要相当长的时间段。 Although this step is an acceptable method, this step involving a highly converted functional polymer is not preferred because an additional solvent removal step is required, another material may be required (the non-monomeric solvent), and a high molecular weight, highly converted solute polymer dissolved in the monomer mixture may require a long period of time. 聚合优选地在不存在溶剂下进行，该溶剂与浆料组合物的组分的官能团不反应， 诸如乙酸乙酯、甲苯和四氢呋喃。  The polymerization is preferably carried out without a solvent in the presence of functional groups of components of the solvent and the slurry composition does not react, such as ethyl acetate, toluene and tetrahydrofuran. 溶剂影响聚合物链中不同单体的掺入速率，并且由于溶液的聚合物凝胶或析出物一般导致较低的分子量。 The solvent in the polymer chain influence the rate of incorporation of different monomers, and since the polymer precipitates or gel solution generally results in a lower molecular weight. 因此，（例如，压敏）粘合剂可不含非聚合型有机溶剂。 Thus, (e.g., pressure-sensitive) adhesive can be free of non-polymerizable organic solvent. 可用的光引发剂包括安息香醚诸如安息香甲醚和安息香异丙醚；取代的苯乙酮诸如以商品名IRGA⑶RE651或ESA⑶REKB-I光引发剂（宾夕法尼亚州西切斯特的沙多玛公司（SartomerCo.,WestChester,PA))购得的2, 2-二甲氧基-2-苯基苯乙酮光引发剂， 和二甲基羟基苯乙酮；取代的a-酮，诸如2-甲基-2-羟基苯丙酮；芳香族磺酰氯，诸如2-萘-磺酰氯；和光敏性肟，诸如1-苯基-1，2-丙二酮-2- (0-乙氧基-羰基）肟。  available photoinitiators include benzoin ethers such as benzoin methyl ether and benzoin isopropyl ether; substituted acetophenones such as a trade name or IRGA⑶RE651 ESA⑶REKB-I photoinitiator (Sartomer Company of West Chester, Pennsylvania (SartomerCo, WestChester, PA.)) commercially available 2,2-dimethoxy-2-phenylacetophenone photoinitiator, and dimethyl-hydroxyacetophenone; a- substituted ketones, such as 2 methyl-2-hydroxypropiophenone; aromatic sulfonyl chlorides, such as 2-naphthalene - sulfonyl chloride; and photosensitive oximes, such as 1-phenyl-1,2-propanedione-2- (ethoxy-0- - carbonyl) oxime. 这些之中尤其优选的是取代的苯乙酮。 Especially preferred among these are the substituted acetophenones. 优选的光引发剂是发生NorrishI裂解以产生自由基的光敏化合物，所述自由基可通过对丙烯酸类的双键的加成来进行引发。  Preferred photoinitiators are cleaved to generate occur NorrishI photoactive compounds radicals, the double bond by free radical addition to acrylic initiator. 可以在聚合物已形成后将光引发剂添加至待涂布的混合物，即可将光引发剂添加至浆料组合物。 Can photoinitiator mixture is added after the polymer has been formed to be coated, the photoinitiator can be added to the slurry composition. 这种聚合型光引发剂例如在美国专利5, 902, 836 和5, 506, 279(Gaddam等人）中有所描述。 Such polymerizable photoinitiators are described for example in U.S. Patent No. 5, 902, 836 and 5, 506, 279 (Gaddam et al.). 相对于100重量份的总浆料含量，这种光引发剂优选以0. 1重量份至1. 0重量份的量存在。  with respect to 100 parts by weight of the total content of the slurry, the photoinitiator is preferably present in 0.1 parts by weight 1.0 parts by weight to. 因此，当光引发剂的消光系数低时，可以得到相对厚的涂层。 Thus, when the low extinction coefficient of the photoinitiator, the coating can be relatively thick. 可以用活化性UV辐射来照射浆料组合物和光引发剂以聚合单体组分。  may be irradiated with activating UV radiation to the slurry composition and a photoinitiator to the polymerizable monomer component. 紫外光源可有两种类型：1)相对低强度的光源诸如背光源，其在280纳米至400纳米的波长范围内提供通常为10mW/cm2或更低的光强（根据美国国家标准与技术研究所（UnitedStates NationalInstituteofStandardsandTechnology)认可的方法测量，例如用弗吉尼亚州斯特林的电子仪表与技术公司（ElectronicInstrumentation&Technology,Inc.，Sterl ing，VA)生产的UVIMAPUM365L-S辐射计测量），和2)相对高强度的光源诸如中压汞灯， 其提供通常大于10mW/cm2,优选地15至450mW/cm2的强度。 UV light sources can be of two types: 1) relatively low light intensity sources such as a backlight, which typically provides 10mW / cm2 or less light intensity (the American National Standards Research and Technology in the wavelength range of 280 nm to 400 nm the (UnitedStates NationalInstituteofStandardsandTechnology) accepted method of measuring, for example, production of Sterling, VA electronic Instrumentation & technology (ElectronicInstrumentation & technology, Inc., Sterl ing, VA) radiation measured UVIMAPUM365L-S), and 2) relatively high intensity light sources such as medium pressure mercury lamps which provide generally greater than 10mW / cm2, preferably 15 to intensity of 450mW / cm2 of. 在利用光化福射完全或部分聚合浆料组合物时，高强度和短暴露时间是优选的。 Where actinic Four exit completely or partially during the polymerization slurry composition, high intensity and short exposure times are preferred. 例如，可成功地使用600mW/cm2的强度和约1秒的暴露时间。 For example, it can be used successfully intensity 600mW / cm2 of about 1 second exposure time. 强度可在0.lmW/cm2至150mW/cm2,优选地0. 5mW/cm2至100mW/cm2,更优选地0. 5mW/cm2至50wW/cm2的范围内。 Strength may 0.lmW / cm2 to 150mW / cm2, preferably 0. 5mW / cm2 to 100mW / cm2, more preferably in the range of 0. 5mW / cm2 to 50wW / cm2 of. 如前所述，在照射期间可通过测量聚合介质的折射率来监测转化度。  As described above, the conversion can be monitored during the irradiation by measuring the index of refraction of the polymeric medium. 可用的涂料粘度以在至多30%，优选地2%至20%，更优选地5%至15%，最优选地7%至12%的范围内的转化率（即可得的聚合的单体的百分比）而获得。 Available in coating viscosity to up to 30%, preferably 2-20%, more preferably 5-15%, most preferably in the range of conversion of the 7-12% of (i.e., obtained by polymerization of monomers percentage) is obtained. 溶质聚合物的分子量（重均）通常为至少100, 000或250, 000,优选地至少500,OOOg/mol或更大。 The molecular weight of the solute polymer (weight average) of usually at least 100, 000 or 250, 000, preferably at least 500, OOOg / mol or greater. 在制备本文所述的（甲基）丙烯酸类聚合物时，有利的是光引发的聚合反应在温度低于70°C(优选地在50°C或更低）、反应时间少于24小时、优选地少于12小时并且更优选地少于6小时的情况下持续到几乎完成，即单体组分耗尽。  When (meth) acrylic polymer was prepared as described herein, is advantageous photoinitiated polymerization at a temperature below 70 ° C (preferably 50 ° C and or less), the reaction time is less than It continued until almost complete in a 24 hours, preferably less than 12 hours and more preferably less than 6 hours, i.e., monomer component is exhausted. 这些温度范围和反应速率能避免需要自由基聚合抑制剂，自由基聚合抑制剂通常被添加到丙烯酸类体系中以使丙烯酸类体系稳定化而不出现不期望的过早聚合及胶凝作用。 These temperature ranges and reaction rates can avoid the need for a radical polymerization inhibitor, the radical polymerization inhibitor is generally added to acrylic systems to an acrylic system undesirable premature polymerization and gelation occurs without stabilization. 此外，抑制剂的添加增加外来物质， 所述外来物质将保持在体系中，并抑制浆料组合物的所需的聚合和交联的压敏粘合剂的形成。 Furthermore, addition of inhibitors to increase foreign substances, the foreign substances will remain in the system, and inhibits the desired polymerization and crosslinking of the pressure-sensitive adhesive composition of the slurry. 在70°C或更高的加工温度持续大于6小时至10小时的反应时间段，则常常需要自由基聚合抑制剂。 The reaction period at 70 ° C or more greater than the processing temperature for 6-10 hours, then the free-radical polymerization inhibitors are often required. 所述压敏粘合剂可任选地包含一种或多种常规添加剂。  The pressure sensitive adhesive can optionally include one or more conventional additives. 优选的添加剂包括增粘剂、增塑剂、染料、抗氧化剂、UV稳定剂，和（例如，无机）填料，诸如（例如，热解法）二氧化硅和玻璃泡。 Preferred additives include tackifiers, plasticizers, dyes, antioxidants, UV stabilizers, and (e.g., an inorganic) filler, such as (e.g., fumed) silica, and glass bubbles. 在一些实施例中，压敏粘合剂包含热解法二氧化硅。  In some embodiments, the pressure sensitive adhesive comprises fumed silica. 热解法二氧化硅（也称为热解硅石）是由四氯化硅的火焰热解或者由在3000°C电弧中汽化的石英砂制成的。 Fumed silica (also called pyrogenic silica) is a solution heat by the flame of silicon tetrachloride or of a vaporized at 3000 ° C arc quartz sand. 热解法二氧化硅包括熔融成（如，支化）三维初级颗粒（聚集成较大颗粒）的无定形二氧化硅的微观小滴。 Fumed silica comprises fused into (e.g., branched) primary particles three-dimensional (aggregated into larger particles) amorphous silica of microscopic droplets. 由于聚集体通常不分解，则热解法二氧化硅的平均粒度为聚集体的平均粒度。 Since the aggregates usually not decomposed, the thermal fumed silica is a mean particle size average particle size of aggregates thereof. 热解法二氧化硅可商购自多个全球生产商，包括以商品名"Aerosil"购自赢创公司（Evonik);以商品名"Cab-0-Sil"购自卡博特公司（Cabot)，和威凯化学一道康宁公司(WackerChemie-DowCorning)。 Fumed silica commercially available from several global manufacturers, including the trade name "Aerosil" commercially available from Evonik (Evonik); the trade name "Cab-0-Sil" was purchased from Cabot Corporation (Cabot ), a Corning and Wacker chemical (WackerChemie-DowCorning). 合适的热解法二氧化娃的BET表面积通常为至少50m2/g、 或75m2/g、或100m2/g。 Suitable BET surface area of ​​fumed silica typically at least baby 50m2 / g, or 75m2 / g, or 100m2 / g. 在一些实施例中，热解法二氧化娃的BET表面积不大于400m2/g、或350m2/g、或300m2/g、或275m2/g、或250m2/g。 In some embodiments, BET surface area of ​​fumed silica is not greater than Wa 400m2 / g, or 350m2 / g, or 300m2 / g, or 275m2 / g, or 250m2 / g. 热解法二氧化硅聚集体优选地包括具有不大于20nm或15nm的原生粒度的二氧化硅。 Fumed silica aggregates preferably comprises a primary particle size not larger than 20nm or 15nm silica. 聚集体粒度显著大于原生粒度，并且通常为至少IOOnm或更大。 Aggregate particle size is significantly larger than the original particle size, and typically at least IOOnm or greater. (例如，热解法）二氧化硅的浓度可变化。  (e.g., fumed) silicon dioxide concentration can be varied. 在一些实施例中，诸如对于可适形的压敏粘合剂，粘合剂包含至少〇. 5重量％、1.0重量％、1. 1重量％、1. 2重量％、1. 3重量％、 1.4重量％或1.5重量％的（例如，热解法）二氧化硅，并且在一些实施例中，不大于5重量％、4重量％、3重量％或2重量％。 In some embodiments, such as for conformable pressure-sensitive adhesive, the binder comprises at least square. 5 wt%, 1.0 wt%, 1.1 wt%, 1.2 wt%, 1.3 wt% , 1.4 wt% or 1.5% by weight (e.g., fumed) silica, and in some embodiments, no greater than 5 wt%, 4 wt%, 3 wt%, or 2 wt%. 在其它实施例中，粘合剂包含至少5重量％、6重量％、 7重量％、8重量％、9重量％或10重量％的（例如，热解法）二氧化硅，并且通常不大于20 重量％、19重量％、18重量％、17重量％、16重量％或15重量％的（例如，热解法）二氧化娃。 In other embodiments, the binder comprises at least 5 wt%, 6 wt%, 7 wt%, 8 wt%, 9 wt.% Or 10 wt% (e.g., fumed) silica, and typically not more than 20 wt%, 19 wt%, 18 wt%, 17 wt%, 16 wt% or 15 wt% (e.g., fumed) silica baby. 在一些实施例中，压敏粘合剂包含玻璃泡。  In some embodiments, the pressure sensitive adhesive comprises glass bubbles. 合适的玻璃泡一般具有在约0. 125g/ cc至约0. 35g/cc范围内的密度。 Suitable glass bubbles having a density typically in the / cc range of about 0. 125g / cc to about 0. 35g of. 在一些实施例中，玻璃泡具有小于0. 30g/cc、0. 25g/cc、 或0.20g/cc的密度。 In some embodiments, the glass bubbles have less than 0. 30g / cc, 0. 25g / cc, a density of 0.20g cc or /. 玻璃泡一般具有粒度的分布。 Glass bubbles typically have a distribution of particle sizes. 在典型的实施例中，90%的玻璃泡具有至少75微米且不大于115微米的粒度（按体积计）。 In an exemplary embodiment, 90% glass bubbles having a size of at least 75 microns and not more than 115 microns (by volume). 在一些实施例中，90 %的玻璃泡具有至少80微米、85微米、90微米或95微米的粒度（按体积计）。 In some embodiments, 90% of glass bubbles having at least 80 microns, 85 microns, 90 microns, or 95 microns particle size (by volume). 在一些实施例中，玻璃泡具有至少250psi且不大于1000psi、750psi或500psi的压碎强度。 In some embodiments, the glass bubbles having not more than at least of 1000 psi 250psi, or 500psi to 750psi crush strength. 玻璃泡可从多种来源商购获得，包括明尼苏达州圣保罗的3M公司（3M，St.Paul，MN)。 Glass bubbles are commercially available from a variety of sources, including the St. Paul, Minnesota, 3M Company (3M, St.Paul, MN). 玻璃泡的浓度可变化。 The concentration of  the glass bubbles may be varied. 在一些实施例中，粘合剂包含至少1重量％、2重量％、3重量％、4重量％或5重量％的玻璃泡，并且通常不大于20重量％、15重量％或10重量％的玻璃泡。 In some embodiments, the binder comprises at least 1 wt%, 2 wt%, 3 wt%, 4 wt%, or 5 wt% of glass bubbles, and typically no greater than 20 wt%, 15 wt% or 10 wt.% Of glass bubbles. 包含玻璃泡可减小粘合剂的密度。  A glass bubbles may reduce the density of the adhesive. 减小粘合剂的密度的另一种方式是将空气或其它气体掺入粘合剂组合物中。 Another way to reduce the density of the binder is incorporated into the air or other gas in the adhesive composition. 例如，（例如，浆料）粘合剂组合物可被输送至起泡器，如例如美国专利4, 415, 615 (以引用方式并入本文）所描述。 For example, (e.g., paste) adhesive composition may be delivered to the bubbler, for example, as U.S. Patent No. 4, 415, 615 (incorporated by reference herein) described herein. 当将氮气进料至起泡器中时，起泡浆料可被递送至一对透明（例如，双轴向取向的聚对苯二甲酸乙二酯）膜之间的辊涂布机的辊隙中。 When the nitrogen gas was fed to the bubbler, bubbling slurry may be delivered to a pair of transparent (e.g., biaxially oriented polyethylene terephthalate) between roll coater film gap. 硅氧烷或含氟化合物表面活性剂包含于起泡浆料中。 Silicone or fluorochemical surfactant contained in the foamed slurry. 已知多种表面活性剂包含美国专利6, 852, 781中所述的共聚物表面活性剂。 Known more surfactants comprising copolymer surfactants in U.S. Pat the active agent 6, 852, 781. 在一些实施例中，不使用增粘剂。  In some embodiments, the tackifier is not used. 当使用增粘剂时，浓度的范围可为5重量％或10 重量％至40重量％、45重量％、50重量％、55重量％或60重量％的（例如，固化）粘合剂组合物。 When a tackifier is used, the concentration may range from 5 wt.% Or 10 wt% to 40 wt%, 45 wt%, 50 wt%, 55 wt% or 60 wt% (e.g., cure) the adhesive composition . 多种类型的增粘剂包括酚改性的萜烯和松香酯，诸如可以商品名"Nuroz"、 "Nutac"（纽卜特贸易公司（NewportIndustries))、"Permalyn"、"Staybelite"、 "Foral"（伊士曼公司（Eastman))购得的松香的甘油酯和松香的季戊四醇酯。  Various types of tackifiers include terpene and phenol-modified rosin esters, such as the trade name "Nuroz", "Nutac" (Niubo Te Trading Company (NewportIndustries)), "Permalyn", "Staybelite" , "Foral" (Eastman (Eastman)) commercially available rosin glycerol ester and rosin pentaerythritol. 通常来自石油脑裂解的C5和C9单体副产物的烃类树脂增粘剂也可得到，并可以商品名"Piccotac"、 "Eastotac"、"Regalrez"、"Regalite"（伊士曼公司（Eastman) )、"Arkon"（荒川化学工业株式会社（Arakawa))、"Norsolene"、"Wingtack"（克雷威利公司（CrayValley))、 "Nevtack"、LX(内维尔化学公司（NevilleChemicalCo.))、"Hikotac"、"Hikorez"（可隆化学公司（KolonChemical))、"Novares"（吕特格斯公司（(RuetgersN.V. ))、 "Quintone"（瑞翁公司（Zeon))、"Escorez"（埃克森美孚化工公司（ExxonMobile Chemical))、"Nures"和"H-Rez"（纽卜特贸易公司（NewportIndustries))购得。在这些之中，松香的甘油酯和松香的季戊四醇酯，诸如可以商品名"Nurodutac"和"Foral"获得的，视为生物基材料。 Hydrocarbon resin tackifiers is generally from naphtha cracking of C5 monomers and C9 byproducts can be obtained, and the trade name "Piccotac", "Eastotac", "Regalrez", "Regalite" (Eastman (Eastman )), "Arkon" (Arakawa chemical industries, Ltd. (Arakawa)), "Norsolene", "Wingtack" (Cray Valley (CrayValley)), "Nevtack", LX (Neville chemical company (NevilleChemicalCo.)) , "Hikotac", "Hikorez" (Kolon chemical company (KolonChemical)), "Novares" (Lvtegesi company ((RuetgersN.V. )), "Quintone" (Zeon (Zeon)), "Escorez "(ExxonMobil Chemical company (ExxonMobile Chemical))," Nures "and" H-Rez "(Niubu Te trading company (NewportIndustries)) are commercially available. among these, glycerol esters of rosin and pentaerythritol esters of rosin such as available under the trade name "Nurodutac" and "Foral", regarded as bio-based materials. 根据组分的种类和量，压敏粘合剂可配制成具有多种性质以用于各种最终用途。  The kind and amount of the components, the pressure-sensitive adhesive may be formulated to have various properties for various end uses. 在一个具体实施例中，粘合剂组合物和厚度选择成提供性质的协同组合。  In one particular embodiment, the adhesive composition and thickness selected to provide a synergistic combination of properties. 在该实施例中，粘合剂可表征为具有以下属性中的任一者或其组合，这些属性包括可适形的、可干净移除的、可重复使用的、可再活化的，并且表现出对粗糙表面的良好粘附力。 In this embodiment, the adhesive may be characterized as having the following properties in one or a combination of any of these properties include conformable, cleanly removable, reusable, can be reactivated, and the performance of good adhesion to rough surfaces. 因此，在一些实施例中，PSA为可适形的。  Thus, in some embodiments, the PSA is conformable. 粘合剂的适形能力可利用多种技术来表征，诸如动态力学分析（如通过实例中所描述的测试方法所测定），该动态力学分析可用于测定剪切损耗模量（G")、剪切储能模量（G'）和损耗角正切值（定义为剪切损耗模量（G") 对剪切储能模量（G'）的比率）。 Conformability of the adhesive may be characterized using a variety of techniques, such as dynamic mechanical analysis (as determined by the test method described in the examples), dynamic mechanical analysis of the shear loss modulus (G ") can be used for the determination, shear storage modulus (G ') and loss tangent (defined as the shear loss modulus (G ") to shear storage modulus (G' ratio)). 如本文所用，"可适形的"是指（例如，第一）粘合剂，该粘合剂在25°C和1赫兹下表现出至少0. 4或更大的损耗角正切值。 As used herein, a "conformable" refers to a (e.g., first) adhesive, which exhibits at least 0.4 or greater loss angle tangent, and at 25 ° C for 1 Hz. 在一些实施例中，（例如， 第一）粘合剂在25 °C和1赫兹下具有至少0. 45、0. 50、0. 55、0. 65或0. 70的损耗角正切值。 In some embodiments, (e.g., the first) adhesive has a loss angle of at least 0. 45,0. 50,0. 55,0. 65 or .70 in the tangent and 25 ° C for 1 Hz. (例如，第一）粘合剂在25°C和1赫兹下的损耗角正切值通常不大于0. 80或1. 0。 (E.g., the first) and the binder at 25 ° C under 1 MHz loss angle tangent of typically no greater than 0.80 or 1.0. 在一些实施例中，（例如，第一）粘合剂在1赫兹和40°(：、60°(：、80°(：、100°(：和120°(：的温度下的损耗角正切值不大于1. 0。在一些实施例中，第一粘合剂层在1赫兹和40 °C、60 °C、80 °C、100°C 和120°C下具有至少0. 4或更大的损耗角正切值。 In some embodiments, (e.g., the first) and the adhesive in 1 Hz 40 ° (:, 60 ° (:, 80 ° (:, 100 ° (: and 120 ° (: temperature of the loss angle tangent is not greater than 1. 0. in some embodiments, the first adhesive layer is 1 Hz and 40 ° C, at 60 ° C, 80 ° C, 100 ° C and 120 ° C having at least 0.4 or more large loss tangent. PSA和粘合剂涂覆的制品可表现出对平滑和粗糙表面两者的良好粘附力。  PSA and adhesive-coated articles can exhibit good adhesion to both smooth and rough surfaces. 各种粗糙表面已知包括例如纹理化干燥壁，诸如"拆卸"和"橘皮"；煤渣砖、粗糙（例如，巴西）瓦片和纹理化水泥。 Rough surfaces include for example the various known drying textured wall, such as "Removal" and "orange peel"; cinder blocks, coarse (e.g., Brazil) and texturing tile cement. 光滑表面（诸如不锈钢、玻璃和聚丙烯）具有平均表面粗糙度（Ra)，如可通过小于100纳米的光学干涉术所测量，然而粗糙表面具有大于1微米（1000纳米）、5微米或10微米的平均表面粗糙度。 Smooth surface (such as stainless steel, polypropylene and glass) having an average surface roughness (Ra of the), as may be less than 100 nanometers measured by optical interferometry, but greater than 1 micron surface roughness (1000 nanometers), 5 microns or 10 microns the average surface roughness. 具有超过5微米或10微米的粗糙度的表面可用触笔轮廓术来测量。  with more than 5 microns or 10 microns roughness of the surface can be measured by stylus profilometry. 标准（未纹理化）干燥壁具有约10-20微米的平均表面粗糙度（Ra)和150微米至200微米的最大峰值高度（Rt，利用维易科公司（Veeco)的视觉软件）。 Standard (non-textured) sulfate wall has an average surface roughness of about 10-20 microns (Ra) and the maximum peak height of 150 microns to 200 microns (Rt, using Veeco (Veeco) vision software). 橘皮和拆卸干燥壁具有大于20微米、25 微米、30微米、35微米、40微米或45微米的平均表面粗糙度（Ra)和大于200微米、250微米、300微米、350微米或400微米的最大峰值高度（Rt)。 Removing and dried orange peel wall having greater than 20 microns, 25 microns, 30 microns, average surface roughness of 35 microns, 40 microns, or 45 microns (Ra) and greater than 200 microns, 250 microns, 300 microns, 350 microns or 400 microns The maximum peak height (Rt). 橘皮干燥壁可具有约50-75微米的平均表面粗糙度（Ra)和450-650微米的最大峰值高度（Rt)。 Orange drying wall may have an average surface roughness of about 50-75 microns (Ra) and the maximum peak height of 450-650 microns (Rt). 拆卸干燥壁可具有大于75 微米、80微米或85微米的平均表面粗糙度（Ra)(诸如在90-120微米的范围内）和650-850 微米的最大峰值高度（Rt)。 Removing drying wall may have an average surface roughness (Ra) (such as in the range 90-120 microns) and the maximum peak height (Rt) 650-850 microns greater than 75 microns, 80 microns, or 85 microns. 在典型的实施例中，Ra不大于200微米、175微米或150微米， 并且Rt不大于1500微米、1250微米或1000微米。 In an exemplary embodiment, Ra of the not more than 200 microns, 175 microns or 150 microns, and not greater than 1500 microns Rt, 1250 microns or 1000 microns. 煤渣砖和巴西瓦片通常具有与橘皮干燥壁类似的平均表面粗糙度（Ra)。 Cinder block Ba Xiwa and dried orange peel sheet generally has a wall similar average surface roughness (Ra). 尽管许多可适形粘合剂表现出对粗糙表面的良好初始粘附力，但是本文所描述的PSA和制品可表现出对橘皮干燥壁至少500分钟的剪切力（以250g的质量）。  Although many conformable adhesive exhibits good initial adhesion to rough surfaces, but the PSA and articles described herein may exhibit a shear peel force of at least 500 minutes drying wall (in 250g of quality). 在一些实施例中，PSA和制品可表现出对橘皮干燥壁至少1000分钟、2000分钟、3000分钟、4000分钟、 5000分钟、6000分钟、7000分钟、8000分钟、9000分钟或10000分钟的剪切力（以250g的质量）。 In some embodiments, PSA, the article may exhibit a wall on the dried peel of at least 1000 minutes 2000 minutes 3000 minutes 4000 minutes 5000 minutes 6000 minutes 7000 minutes 8000 minutes 9000 minutes or 10,000 minutes shear force (in a mass of 250g). PSA和粘合剂涂覆的制品可从纸材干净地移除。  PSA and the adhesive-coated article can be cleanly removed from the paper. "可从纸材干净地移除"意指在测试时（根据实例中所示出的测试方法3)，在将粘合剂从该纸材移除之后，纸材不撕裂，并且纸材不具有任何沾污或粘合剂残留。 "Can be cleanly removed from the paper web" is meant in the test (according to the test method shown in Example 3), after the adhesive is removed from the paper, without tearing paper, and the paper web It does not have any adhesive residue or stain. 对纸材的90°剥离值（根据实例中所示出的测试方法3)通常为至少25N/dm且不大于200N/dm或175N/dm。 90 ° peel values ​​of the paper material (according to the test method shown in Example 3) is typically at least 25N / dm and not more than 200N / dm or 175N / dm. 在一些实施例中，对纸材的90 ° 剥离值不大于50N/dm、45N/dm或40N/dm。 In some embodiments, 90 ° peel values ​​of the paper is not more than 50N / dm, 45N / dm or 40N / dm. PSA和粘合剂涂覆的制品可为可重复使用的。  PSA and the adhesive-coated article may be reusable. 可重复使用意指，PSA和/或粘合剂涂覆的制品可重复地移除或重粘附至纸材至少1、2、3、4或5次。 Reusable mean, PSA, / or adhesive coated article may be repeatedly removed or heavy paper adhered to at least four or five times. 在一些实施例中，可重粘附至纸材至少5、10、15或20次，同时保持至少80%、85%或90%的初始剥离粘附力（根据实例中进一步所描述的"可重复使用性"测试）。 In some embodiments, a weight may be adhered to the paper at least 10, 15 or 20 times, while maintaining at least 80%, 85% or 90% of the initial peel adhesion (according to "Examples further described re-use "test). 另外，在一些实施例中，粘合剂可为可重活化的，S卩，污染物可通过用肥皂和水清洁一个或多个粘合剂层来移除，诸如通过WO96/31564(以引用方式并入本文）中所描述的测试方法。  Further, in some embodiments, the adhesive may be re-activated, S Jie, contaminants may be one or more pressure-sensitive adhesive layer was washed with soap and water cleaning to remove, such as by WO96 / 31564 (incorporated by reference herein) in the test methods described. 可使用常规的涂布技术将本发明的粘合剂涂布到多种柔性和刚性的背衬材料上， 从而制备粘合剂涂覆的材料。  Conventional coating techniques may be used according to the present invention, the adhesive is applied to a variety of flexible and rigid backing material, thereby preparing an adhesive-coated material. 柔性基材在本文中定义为通常用作条带背衬或可具有任何其它柔性材料的任何材料。 The flexible substrate to define any material commonly used as a tape backing or strip may have any other flexible material herein. 示例包括但不限于塑料膜，诸如聚丙烯、聚乙烯、聚氯乙烯、聚酯(聚对苯二甲酸乙二酯）、聚碳酸酯、聚甲基（甲基）丙烯酸酯（PMMA)、醋酸纤维素、三乙酸纤维素和乙基纤维素。 Examples include, but are not limited to, plastic films, such as polypropylene, polyethylene, polyvinyl chloride, polyester (polyethylene terephthalate), polycarbonate, poly (meth) acrylate (PMMA), acetic acid cellulose, cellulose triacetate and ethylcellulose. 可使用泡沫背衬。 Foam backing may be used. 在一些实施例中，背衬由生物基材料组成，诸如聚乳酸（PLA)。 In some embodiments, the backing bio-based material, such as polylactic acid (PLA). 背衬也可由织物制备，诸如，由诸如棉、尼龙、人造纤维、玻璃、陶瓷材料等合成或天然材料的线制成的织造织物，或者非织造织物，诸如天然或合成纤维或它们的共混物的气流法网。  The backing fabric may also be prepared, such as a woven fabric made of synthetic cord such as cotton, nylon, rayon, glass, ceramic material or natural material, or nonwoven fabric, such as natural or synthetic fibers or French airflow blend. 背衬还可由金属、金属化聚合物薄膜或陶瓷片材形成，可采取通常已知使用压敏粘合剂组合物的任何制品（诸如标签、条带、标牌、覆盖件、标记等）的形式。 The backing may also be formed of metal, metallized polymeric film, or ceramic sheet, may take any article (such as labels, tapes, signs, covers, marking, etc.) is generally known to use a pressure sensitive adhesive composition in the form of . 背衬可由塑料（例如聚丙烯（包括双轴取向的聚丙烯）、乙烯基、聚乙烯、聚酯（诸如聚对苯二甲酸乙二酯））、非织造物（例如纸材、布、非织造稀松布）、金属箱、泡沫（例如聚丙烯酸类、聚乙烯、聚氨酯、氯丁橡胶）等制成。  The backing may be a plastic (e.g., polypropylene (including biaxially oriented polypropylene), vinyl, polyethylene, polyester (such as polyethylene terephthalate)), nonwovens (e.g. paper, cloth, nonwoven scrims), metal boxes, foams (e.g., polyacrylic, polyethylene, polyurethane, neoprene) or the like. 泡沫可购自多个供应商，诸如3M公司（3M Co.)、沃泰克公司（Voltek)、积水株式会社（Sekisui)和其它。 Foams are commercially available from various suppliers, such as 3M Company (3M Co.), Wotai Ke Company (Voltek), water Corporation (of Sekisui) and others. 泡沫可成型为共挤出的片材，该片材在泡沫的一侧或两侧上具有粘合剂，或者粘合剂可被层合至该片材。 The foam may be molded into a sheet co-extruded sheet having adhesive on one or both sides of the foam, or the adhesive may be laminated to the sheet. 当粘合剂被层合至泡沫时，可能期望的是处理表面以改进粘合剂对泡沫或对任何其它类型的背衬的粘附力。 When the adhesive is laminated to the foam, it may be desirable to treat the surface to improve adhesion of the adhesive to the foam or any other type of backing. 这种处理通常基于粘合剂的材料的性质和泡沫或背衬的性质进行选择，并包括底漆和表面改性（例如电晕处理、表面磨耗）。 Such treatment is typically selected based on the material properties and adhesive properties of the foam or backing and include primers and surface modifications (e.g., corona treatment, surface abrasion). 合适的底漆包括例如EP372756、US553439UUS 6893731、W02011/068754 和W02011/38448 中所述的那些。 Suitable primers include those e.g. EP372756, US553439UUS 6893731, W02011 / 068754 and W02011 / 38448 in the. 在一些实施例中，背衬材料为透明膜，该透明膜具有至少90%的可见光透射率。  In some embodiments, the backing material is a transparent film, the transparent film having at least 90% of visible light transmittance. 透明膜还可包括图形。 It may further comprise a transparent film pattern. 在该实施例中，粘合剂还可为透明的。 In this embodiment, the adhesive may be transparent. 可以使用经改进为适于特殊基材的常规涂布技术将上述组合物涂布至基材上。  can be improved using conventional coating techniques suitable for the particular substrate, the above-described composition is coated onto a substrate. 例如，可以通过方法诸如辊涂、流涂、浸涂、旋涂、喷涂、刮涂和模涂把这些组合物施加到多种固体基材上。 For example, by a method such as roller coating, flow coating, dip coating, spin coating, spray coating, knife coating, and die coating composition is applied to these a variety of solid substrates. 组合物还可由熔体进行涂布。 The composition may also be coated from the melt. 这些多种涂布方法允许将这些组合物按照不同厚度涂布在基材上，从而使得这些组合物得到更广泛的应用。 These methods allow a variety of coating compositions to the different thickness of the coating on the substrate, such that these compositions to give a wider range of applications. 可如之前所述改变涂层厚度。 The coating thickness may be altered as previously. 浆料组合物可以具有用于随后涂布的任何所需的浓度，但通常在单体中为5重量％至20重量％的聚合物固体。 The slurry composition may have any desired concentration for subsequent coating, but is usually 20 wt.% To 5 wt% of polymer solids in monomer. 可通过进一步稀释涂料组合物或者通过部分干燥来得到所需的浓度。 Can be obtained by concentration of the desired partial drying the coating composition by further dilution, or. 涂层厚度可从约25至1500微米（干燥厚度）变化。 The coating thickness may vary from about 25 to 1500 microns (dry thickness). 在典型的实施例中，涂层厚度在约50微米至250微米的范围内。 In an exemplary embodiment, the coating thickness in the range of about 50 microns to 250 microns. 当多层PSA或制品旨在粘结至粗糙表面时，粘合剂层的厚度范围通常为从平均粗糙度（Ra)至略大于最大峰值高度（Rt)。 When the article or multi-layer PSA intended adhered to the roughened surface, the thickness of the adhesive layer is usually from an average roughness (Ra) to slightly greater than the maximum peak height (Rt). 粘合剂也可以压敏粘合剂转移条带的形式提供，其中粘合剂的至少一层设置在隔离衬件上以用于在以后施加至持久基材。 The adhesive may be in the form of pressure-sensitive adhesive transfer tape is also provided, wherein the at least one layer of adhesive is disposed on a release liner for applying to the substrate after lasting. 粘合剂也可以单一涂布或双涂布的条带提供，其中粘合剂设置在持久背衬上。 The adhesive may be a single coating or a double-coated article is also provided with which the permanent binder in the backing provided. 对于单侧条带，与设置粘合剂之处相对的背衬表面的侧面通常涂布有合适的隔离材料。 Typically coated side  For single-sided tape, with the adhesive backing is provided at opposite surfaces with a suitable insulating material. 隔离材料是已知的，并包括材料诸如例如硅氧烷、聚乙烯、聚氨基甲酸酯、聚丙烯酸类等。 Isolation materials are known and include materials such as, for example, silicone, polyethylene, polyurethane, polyacrylic acids and the like. 对于双涂布条带，另一粘合剂层设置在与本发明的粘合剂设置之处相对的背衬表面上。 For double coated tapes, pressure-sensitive adhesive layer is further disposed on the adhesive of the present invention is disposed opposite to the backing surface. 另一粘合剂层可不同于本发明的粘合剂，例如，常规丙烯酸类PSA，或者其可为具有相同或不同配方的与本发明相同的粘合剂。 Another adhesive layer may be different from the adhesive of the invention, e.g., a conventional acrylic the PSA, or it may be the same or different formulations of the present invention having the same adhesive. 双涂布的条带通常承载在隔离衬件上。 Double coated tapes are typically carried on a release liner. 另外的条带构造包括美国专利5, 602, 221 (Bennett等人）中所述的那些，该专利以引用方式并入本文。 Further comprising a strip configuration U.S. Patent No. 5, 602, 221 (Bennett et al. ), Those which patent is incorporated herein by reference. 本发明的对象和优点将通过下列实例进一步说明。  Objects and advantages of the present invention will be further illustrated by the following examples. 这些实例中所列的特定材料和含量，以及其它条件和细节，不应用于不当限制本发明。 These specific examples of the materials and amounts listed, as well as other conditions and details, should not be used to unduly limit the present invention. 本文所用，所有的百分比和份数按重量计。  As used herein, all percentages and parts are by weight. 添加剂（例如，交联剂、光引发剂、增粘剂等）的量以份/百份树脂（Phr)表述，其中100份的树脂表示形成聚合物主链（例如， IOA、20A、AA)的单体的重量。 Amount of the additive (e.g., a crosslinking agent, a photoinitiator, a thickener, etc.) in parts / hundred resin (Phr) statements, 100 parts of a resin forming the polymer backbone represented by (e.g., IOA, 20A, AA) monomer weight. 500mL广口瓶为石英广口瓶。  500mL jar of quartz jar. 通过用甲基乙基酮和干净KimwipeR薄纸（金佰利公司（Kimberly-Clark))清洁三次，制备不锈钢（SS)板被用于测试。  is used for testing by a cleaning three times with methyl ethyl ketone and a clean KimwipeR tissue (Kimberly-Clark Corporation (Kimberly-Clark)), prepared in a stainless steel (SS) plate. 将所描述的粘合剂膜切割成条（宽度为I. 27cm) 并通过其粘合性粘附至平坦刚性不锈钢板，其中精确2. 54cm长的每个粘合剂膜条接触粘附至其的板。 The contact adhesive film was cut into strips as described in (a width of I. 27cm) and through which the flat adhesive adhered to a rigid stainless steel plate, wherein each of precise 2. 54cm long adhered to the adhesive film strip of its board. 将2千克（4. 5镑）的砝码滚过粘附部分。 The 2 kg (4.5 pound) weight is rolled over the adhered portion. 具有粘附膜条的所得板中的每个在室温下进行平衡15分钟。 The resultant film sheet having adhesive strips are each at equilibrium at room temperature for 15 min. 之后，将样品输送至70°C的烘箱，其中将500g的砝码吊挂于粘附膜条的自由端，其中面板从竖直倾斜2°以确保针对任何剥离力。 Thereafter, the sample was conveyed to an oven at 70 ° C, wherein a 500g weight hanging at the free end of the adhesive film strip, wherein the panel is tilted 2 ° from the vertical in order to ensure against any peel forces. 记录砝码由于粘合剂膜条从板释放而掉落的时间（以分钟为单位）如果未出现失效，则测试在10000分钟终止。 Record the weight from the plate because the adhesive film strip releasing from falling time (in minutes) if the failure is not present, the test is terminated at 10,000 minutes. 在表中，这标记为10000+分钟。 In the table, which is marked as 10,000 + minutes. 每个条带（粘合剂膜条）的两个标本进行测试，并且对剪切强度测试进行平均以获得表1-7中的所记录的剪切值。 Two specimens of each strip (adhesive film strip) were tested and the shear strength tests were averaged to obtain a record of the shear values ​​in Table 1-7. 在一些情况下，样品以相同方式但在室温（RT)而非70°C下制备并吊挂。 , But samples were prepared and hung in some cases in the same manner at room temperature (RT), rather than 70 ° C. 进行测试的温度在每个表中指出。 Temperature tests indicated in each table. 使用IMASSSP-200滑动/剥离测试仪（可购自马萨诸塞州阿科德的艾玛氏有限公司（IMASS，Inc.，AccordMA))以305毫米/分钟（12英寸/分钟）的剥离速率测量180° 剥离角的剥离粘合强度。  Using IMASSSP-200 slip / peel tester (available from Arco de Emma, ​​Massachusetts Limited's (IMASS, Inc., AccordMA)) at 305 mm / min (12 inches / min) peel rate measurement peel angle of 180 ° peel adhesive strength. 不锈钢（SS)测试面板如上所述制备。 Stainless steel (SS) test panels prepared as described above. 将清洁的面板在室温下干燥。 The cleaned panel was dried at room temperature. 将粘合剂涂覆膜切割成测量为1. 27厘米X20厘米（1/2英寸X8英寸）的条带。 The adhesive coated film was cut into 1.27 cm as measured X20 cm (1/2 inch X8 inch) strips. 测试样品通过以下方式制备，使条带以2. 0kg(4. 51b. )的橡胶辊在清洁面板上滚动两次。 Test samples were prepared by the strip to 2. 0kg (4. 51b.) Rubber roller rolling twice the cleaning panel. 测试之前将制备样品在23°C/50%的RH下静置15小时。 The sample preparation was allowed to stand at 23 ° C / 50% RH 15 hours before the test. 对每一实例测试四个样品。 Examples of each of four test samples. 将所得剥离粘附力从盎司/〇. 5英寸转换成盎司/英寸（N/dm)，两种值均记录在表1-7中。 The resulting peel adhesion converted oz / in (N / dm) from oz / square at 5 inches, two kinds of values ​​are recorded in Table 1-7. 不锈钢（SS)基材如上文所提及进行清洁。  Stainless steel (SS) substrate cleaning as mentioned above. 将粘合剂的两个I. 0英寸(2. 54cm)X3.0英寸（7.62cm)条层合至5密耳（127微米）的铝箱背衬以用于测试，并且通过以12英寸/分钟（305mm/min)用6. 8kg的辑在条带上在每个方向上滚动两次而粘附至不锈钢基材（如上所述进行清洁）。 Two I. 0 inch (2. 54cm) X3.0 inch (7.62 cm) strip of pressure-sensitive adhesive laminated to 5 mil (127 microns) Aluminum backing for the test, and by 12 inches / min (305mm / min) with the series 6. 8kg strip rolling twice in each direction is adhered to a stainless steel substrate (cleaned as described above). 用于以90°剥离条带所需的力在25°C/50%的湿度下静止24小时之后在Instron(型号4465)上测量。 For 90 ° peel force required to strip stationary at 25 ° C / 50% humidity after 24 hours measured on an Instron (Model 4465). 两个条带样品的测量结果单位为镑力/ 英寸，其中台板速度为12英寸/分钟（约305mm/min)。 Two tape sample measurement unit of pound / inch, wherein a platen speed of 12 inches / minute (about 305mm / min). 将结果取平均值，并记录在表8中。 The results were averaged and reported in Table 8. 将不锈钢（SS)背衬粘附至不锈钢（SS)基材（如上所述进行清洁），并切下以留下I. 0英寸（2. 54cm)X0. 5英寸（I. 27cm)的方形以用于158°F(70°C)温度剪切测试。  A stainless steel (SS) backing adhered to a stainless steel (SS) substrate (cleaned as described above), and cut to leave I. 0 inch (2. 54cm) X0. 5 inch (I. 27cm ) square for 158 ° F (70 ° C) temperature shear test. 将Ikg的砝码置于样品上持续15分钟。 The weight was placed on the sample Ikg for 15 minutes. 使500g负载附接到条带样品以用于测试。 To make 500g load attachment tape sample for testing. 每个样品都被悬挂直至失效和/或测试结束为止。 Each sample is suspended until the end of the failure and / or testing. 记录失效的时间。 Time failure record. 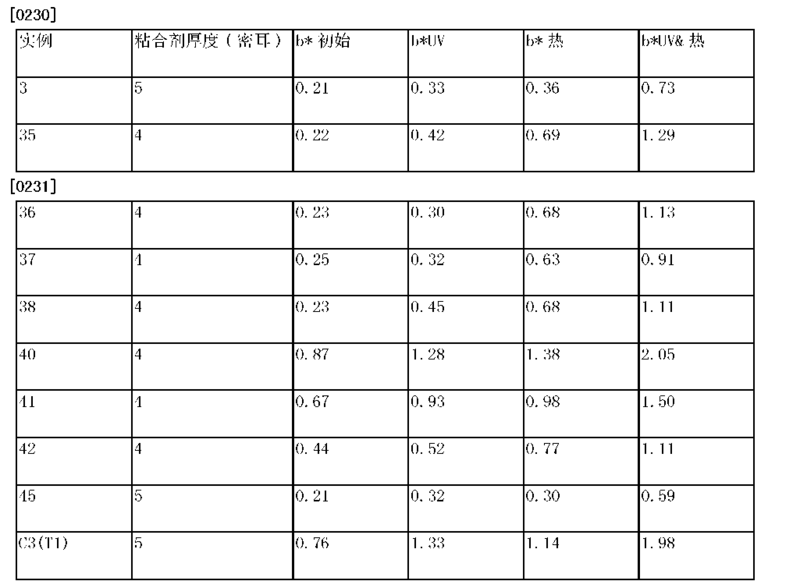 样品进行三次重复操作并取平均值，见下表8。 Triplicate samples were averaged and operation, the following table 8. 1.初始粘合剂，测量为无UV或热老化。  1. Initial adhesive, measured as no UV or thermal aging. 2.UV一一利用DRS-120型Fusion处理器（马德里兰州盖瑟斯堡的辐深紫外系统公司（FusionUVSystems,Inc. ,Gaithersburg,MD))将粘合剂暴露于FusionH灯泡的I. 81J/cm2的UVA光，并在UV暴露24小时之后测量。  2.UV eleven-using DRS-120 Fusion processor (Madrid Gaithersburg spokes deep UV Systems, Inc. (FusionUVSystems, Inc., Gaithersburg, MD)) exposing the adhesive FusionH bulbs I UVA light. 81J / cm2 and measured after 24 hours exposure to UV. 3.热--粘合剂在DespatchLFD系列烘箱中在100°C下老化1周，并且在从烘箱移除之后24小时测量。  3. Thermal - adhesive at 100 ° C for aging in an oven for 1 week DespatchLFD series, and measured 24 hours after removal from the oven. 4.UV和热--UV⑵然后热⑶的组合。  4.UV heat and then heat --UV⑵ ⑶ combination. 样品进行三次重复操作并记录结果平均值。  Triplicate samples and records the results averaged. 从测试样品沿纵向切割1英寸（2. 54cm)宽和>3英寸（7. 62cm)长的标本。  from the test sample cut one inch in the longitudinal direction (2. 54cm) wide and> 3 inches (7. 62cm) long specimen. 从粘合剂的一侧移除衬件并将其置于铝面板（2"X5")上。 The liner was removed and placed in an aluminum panel member (2 "X5") from one side of the adhesive. 从粘合剂的另一侧移除衬件并利用轻微指压将其置于复印纸*(1英寸（2. 54cm)宽和>5英寸（7.62cm))的条上。 Removing the liner from the other side of the adhesive using light finger pressure to the copy sheet placed * (1 inch (2. 54cm) wide and> 5 inches (7.62 cm)) of the strip. 用标准FINAT测试车昆4. 51b(2kg)以大约12〃/min(305mm/min)的速度在每个方向上滚过一次。 Standard FINAT test vehicle Kun 4. 51b (2kg) of about 12〃 / min (305mm / min) speed rolled over once in each direction. 在将条施加至测试面板之后，在使用Instron测试仪之前允许面板样品在恒定温度和湿度（25°C/50% RH)的房间中静置10分钟。 After the strip is applied to the test panel using an Instron tester before allowing the panel to stand the sample at a constant temperature and humidity (25 ° C / 50% RH) room for 10 minutes. 将测试面板和条固定在水平支撑中。 The test strip is fixed to the panel and the horizontal support. 将机器设定在305mm每分钟的夹具分离速率下。 The machine is set at a grip separation rate of 305mm per minute. 测试结果以克力/英寸来测量，并转换成N/dm。 Test results gf / inch measured, and converted to N / dm. 剥离值为三次90° 角剥离测量的平均值。 Peeling the peeling angle measured is the average of three 90 °. *所用的复印纸可以商品名"X-9"（92亮度，241b(90gsm/12M)，500页， 8. 5Xll(216mmX279mm))购自Boise™。  * used copy paper under the trade name "X-9" (92 brightness, 241b (90gsm / 12M), 500 this page, 8. 5Xll (216mmX279mm)) available from Boise ™. 所测试的所有实例可从复印纸干净地移除，除非另外指明，意指在移除粘合剂之后，纸材不撕裂并且也不具有任何沾污或残留。  All examples tested may be cleanly removed from the copy paper, unless otherwise indicated, it means after removal of the binder, and paper without tearing nor any contamination or residue. 每次利用相同粘合剂样品与一张新纸,可重复实用性可通过重复测试方法6来测定，其中每次重复使用视为一个循环。  each using the same sample with a new adhesive sheet, may be repeated 6 can be determined by a practical test method is repeated, wherein each repeated use as a loop. 所采用的基材为标准平滑干燥壁（可购自明尼苏达州伍德伯里的家得宝公司(HomeD印ot，Woodbury,MN))。  The substrate used was a standard smooth wall sulfate (commercially available from Minnesota Woodbury Home Depot (homed printing ot, Woodbury, MN)). 拆卸和橘皮干燥壁由IUPAT(美国明尼苏达州小加拿大国家大道3205号的国际油漆工和业界联盟（InternationalUnionofPaintersand AlliedTrades, 3205CountryDrive,LittleCanada,MN,USA))制备。 Removal and walls made from dried orange peel IUPAT (Minnesota State Road, a small Canadian industry and international painters Soyuz 3205 (InternationalUnionofPaintersand AlliedTrades, 3205CountryDrive, LittleCanada, MN, USA)). 干燥壁利用油漆混与Sherwin-WilliamsPro-Mar200涂底漆。 Drying the mixture by a paint wall Sherwin-WilliamsPro-Mar200 primed. 在施涂下一油漆涂层之前，将表面在环境条件下干燥最少4小时。 Prior to applying the next coat of paint, the surface was dried at ambient conditions for a minimum of 4 hours. 利用新油漆辊将白漆（威士伯标志，高清先进颜色，蛋壳内部（Valspar Signature,Hi-defAdvancedColor,EggshellInterior)，#221399,超白/基料A)施涂至涂底漆的干燥壁，并允许在环境条件下干燥直至在施涂第二相同颜色涂层之前不粘。 The white paint using the new paint roller (Valspar flag, advanced high-definition color, inner shell (Valspar Signature, Hi-defAdvancedColor, EggshellInterior), # 221399, Ultra White / binder A) was applied to the primed dry wall and allowed to dry until tack-free before applying a second coating of the same color under ambient conditions. 将最终刷漆干燥壁在环境条件下干燥过夜，然后置于120°C烘箱中1周。 The final dried paint walls dried overnight under ambient conditions, then placed in an oven at 120 ° C for 1 week. 将样品从烘箱移除并利用刮刀切割成所需尺寸。 The sample was removed and cut to the desired size of the doctor blade from the oven. 利用Kim擦拭物、薄纸、纸巾或空气对样品进行除尘（不用溶剂进行清洁）以在用于测试之前移除切割所留下的粉尘。 Using a Kim wipe, tissue, towel or dusted air sample (without solvent cleaning) to remove prior to testing for the cutting dust left. 根据美国伊利诺伊州芝加哥的压敏条带协会（PressureSensitiveTape Council(Chicago,IL./USA))PSTC- 107(工序G)在升高的温度下进行标准静态剪切测试。  Tape Council (PressureSensitiveTape Council (Chicago, IL. / USA)) PSTC- 107 (Step G) standard static shear test at elevated temperatures the pressure-sensitive strip of Chicago, Illinois. 在70 °F/50%的相对湿度下进行测试，如该方法所要求。 Tested at 70 ° F / 50% relative humidity, as required by the process. 粘结至所制备干燥壁表面的粘合剂的样品区域在竖直方向是2. 54cm，在宽度方向是2. 54cm(而非方法所要求的I. 27cmXI. 27cm)。 Dried adhesive bonded to the wall surface area of ​​the sample is prepared 2. 54cm in a vertical direction, in the width direction 2. 54cm (not claimed method I. 27cmXI. 27cm). 然后，将6. 8kg砝码置于粘结样品区域的顶部上1分钟。 Then, 1 minute 6. 8kg weight was placed on top of the bonded sample area. 在60秒的保压时间之后，将测试标本在所需温度下吊挂于剪切支架并立即加载250g砝码。 After a dwell time of 60 seconds, the test specimens were suspended at a desired temperature and a shear load holder 250g weight immediately. 以分钟为单位记录粘合剂粘结失效的时间。 In minutes of recording time of the adhesive bond failure. 实例55和56 (25密耳厚度）利用DiscoveryHybrid平行板流变仪（Discovery Hybridparallelplaterheometer)(TA仪器公司（TAInstruments))通过动态力学分析(DMA)进行分析以表征作为温度函数的每个样品的物理特性。  Examples 55 and 56 of each sample (25 mil thickness) by dynamic mechanical analysis (DMA) were analyzed using a parallel plate rheometer DiscoveryHybrid (Discovery Hybridparallelplaterheometer) (TA Instruments (TA Instruments)) as a function of temperature to characterize the physical characteristics. 流变特性样品通过以下方式制备：用8mm圆形口模冲压出PSA的节段，将其从隔离衬件移除，使其中心位于流变仪的8_直径平行板之间，以及压缩直至样品的边缘与顶板和底板的边缘统一。 Rheological properties of the sample prepared by: punching out a PSA 8mm circular die segment, which is removed from the release liner member located between its center rheometer 8_ diameter parallel plates, and a compression until top and bottom edge of the edge of the unity of the sample. 关闭围绕平行板和流变仪的轴的炉门，并将温度在20°C下进行平衡并保持1分钟。 Close door and around an axis parallel plate rheometer, and the temperature equilibrated at 20 ° C and held for 1 minute. 然后，温度以:TC/min 从20°C上升至125°C或130°C，同时平行板以IHz的角频率和5%的恒定应变摆动。 Then, temperature: TC / min rise from 20 ° C to 125 ° C or 130 ° C, while the parallel plates oscillating at an angular frequency of IHz and a constant strain of 5%. 结果显示于图1中。 The results are shown in FIG. 将P-香茅醇（300. 00g，I. 92mol;奥德里奇公司（Aldrich))、己烷（1500mL)和三乙胺（212. 49g，2.IOmol;奥德里奇公司（Aldrich))的混合物在冰浴中冷却。  The P- citronellol (300. 00g, I 92mol;. Aldrich (Aldrich)), hexane (1500mL) and triethylamine (212. 49g, 2.IOmol; Aldrich ( the mixture Aldrich)) cooled in an ice bath. 在5小时内逐滴添加丙烯酰氯（190. 08g，2.IOmol;奥德里奇公司（Aldrich))。 Over 5 hours was added dropwise acryloyl chloride (190. 08g, 2.IOmol; Aldrich (Aldrich)). 将混合物在室温下搅拌17小时，然后过滤。 The mixture was stirred at room temperature for 17 hours and then filtered. 将溶液在真空条件下浓缩并用水洗涤。 The solution was washed with water and concentrated under vacuum. 将溶剂在真空条件下去除以提供原油，该原油通过真空蒸馏进行纯化。 The solvent is divided down to provide crude oil vacuum, the crude was purified by vacuum distillation. 在7〇-75°C下，在0. 30mmHg下收集无色油（282. 83g 的香茅丙烯酸酯）。 7〇 at-75 ° C, under a colorless oil was collected (282. 83g of citronellyl acrylate) in 0. 30mmHg. 向配有顶置式搅拌器、加料漏斗和冷凝器的2L的圆底烧瓶中装填香叶醇（195g， I. 25mol;阿法公司（Alfa))、三乙胺（152g，I. 50mol)和二氯甲烷（500mL;EMD公司），然后在冰浴中冷却，并且搅拌混合物。  flask equipped with overhead stirrer, addition funnel and a condenser a 2L round bottom flask charged with geraniol (195g, I. 25mol; Alfa Company (Alfa)), triethylamine (152g, I. 50 mol) and methylene chloride (500mL; EMD Corporation), then cooled in an ice bath, and the mixture was stirred. 在45分钟时段内逐滴添加丙烯酰氯（124g，I. 38mol)在二氯甲烷（IOOmL)中的溶液。 Over 45 minutes period was added dropwise acryloyl chloride in dichloromethane (IOOmL) is (124g, I. 38mol). 当添加完成时，将冰浴移除并且将反应混合物在室温下搅拌过夜。 When the addition was complete, the ice bath was removed and the reaction mixture was stirred at room temperature overnight. 将反应混合物过滤以去除沉淀的盐，并且用150mL部分的盐酸在水中的10%溶液洗涤2次并用150mL部分的碳酸氢钠在水中的饱和溶液洗涤2次。 The reaction mixture was filtered to remove the precipitated salts, hydrochloric acid and washed with 150mL portions of 10% water in the wash solution and washed twice with saturated solution of sodium bicarbonate in 150mL portions of water twice. 将二氯甲烷溶液在碳酸钾上干燥、过滤，并在减压下将溶剂去除。 The dichloromethane solution was dried over potassium carbonate, filtered, and the solvent removed under reduced pressure. 添加吩噻嗪（50mg，0. 2mmolJCI公司）并在减压下蒸馏产物。 Adding phenothiazine (50mg, 0. 2mmolJCI Company) was added and the product was distilled under reduced pressure. 在87°C至92°C的沸腾范围和0.50mm至0.65mm的压力范围内收集产物。 The product was collected in the boiling range of 87 ° C to 92 ° C and a pressure in the range of 0.50mm to 0.65mm. 馏出物的NMR分析确认该结构为丙烯酸香叶酯。 Distillate NMR analysis confirmed the structure geranyl acrylate. 丙烯酸金合欢酯如制备例2所述进行制备，不同的是试剂为金合欢醇（181g， 0.81mol;阿法公司（Alfa))、三乙胺（99g，0.98mol)、二氯甲烷（350mL)和丙烯酰氯（81g， 0. 90mol)在二氯甲烷（90mL)中的溶液。  acrylic acid esters such as acacia prepared in Example 2 was prepared, except that the reagent is farnesol (181g, 0.81mol; A method Company (Alfa)), triethylamine (99g, 0.98mol), dichloro methane (350 mL of) and acrylic acid chloride solution in dichloromethane (90 mL) of (81g, 0. 90mol). 在112°C至118°C的沸腾范围和0. 18mm至0. 25_ 的压力范围内蒸馏并收集所得产物。 Boiling range within 112 ° C to 118 ° C and a pressure range of 0. 18mm to 0. 25-stage distillation and collecting the resulting product. 馏出物的NMR分析确认该结构为丙烯酸金合欢酯。 Distillate NMR analysis confirmed the ester structure of acrylic acacia. 将3-环己稀甲醇（95. 00g，0. 85mol;奥德里奇公司（Aldrich))、二氯甲烧(300mL)和三乙胺（94.llg，0. 93mol;EMD公司）的混合物在冰浴中冷却。  The 3-hexene in methanol (95. 00g, 0 85mol;. Aldrich (Aldrich)), burn dichloromethane (300 mL) and triethylamine (94.llg, 0 93mol;. EMD Corporation ) was cooled in an ice bath. 在4小时内逐滴添加丙烯酰氯（84. 17g，0. 93mol)。 Period of 4 hours was added dropwise acryloyl chloride (84. 17g, 0. 93mol). 将混合物在室温下搅拌17小时，然后过滤。 The mixture was stirred at room temperature for 17 hours and then filtered. 将溶液在真空条件下浓缩，然后用乙酸乙酯（500mL;VWR公司）稀释。 The solution was concentrated under vacuum and then extracted with ethyl acetate (500mL; VWR) was diluted. 将溶液用饱和水性碳酸氢钠和盐水洗涤，然后在硫酸镁上干燥。 The solution was washed with saturated aqueous sodium bicarbonate and brine, then dried over magnesium sulfate. 将溶剂在真空条件下去除以提供原油，该原油通过真空蒸馏进行纯化。 The solvent is divided down to provide crude oil vacuum, the crude was purified by vacuum distillation. 在62°C-64°C下，在I.OmmHg下收集无色油（129. 92g的3-环己稀丙稀酸甲酯）。 At 62 ° C-64 ° C, was collected as a colorless oil (129. 92g 3-cyclohexene acrylic ester) at I.OmmHg. 将^^一碳烯醇（69. 66g，0. 4090mol;阿法公司（Alfa))、甲苯（300mL)和三乙胺(45. 53g，0. 45mol)添加至1000 mL的3颈圆底烧瓶。  A ^ ^ a carbon alcohol (69. 66g, 0 4090mol;. A method Company (Alfa)), toluene (300 mL) and triethylamine (. 45. 53g, 0 45mol) was added to a 1000 mL 3 neck round bottom flask. 将溶液搅拌，并在氮气气氛中冷却至0°C。 The solution was stirred and cooled to 0 ° C in a nitrogen atmosphere. 在4小时的时段内经由加料漏斗逐滴添加丙烯酰氯（40. 73g，0. 45mol)。 Over a period of 4 hours was added dropwise acryloyl chloride (40. 73g, 0. 45mol) via addition funnel. 然后将浑浊黄色混合物缓慢地温热至室温并置于旋转蒸发仪上以去除甲苯。 The cloudy yellow mixture was then allowed to warm slowly to room temperature and placed on a rotary evaporator to remove the toluene. 添加乙酸乙酯（300mL)并且混合物通过硅藻土进行过滤，用饱和碳酸氢钠洗涤，然后将溶剂在真空条件下去除。 Ethyl acetate (300 mL) and the mixture was filtered through celite, washed with saturated sodium bicarbonate, then the solvent removed under vacuum. 黄色原油通过真空蒸馏进行纯化。 Yellow oil was purified by vacuum distillation. 在90°C-96°C下，在0. 88mmHg下收集淡黄色油（55/75g的丙烯酸10-十一碳烯酯）。 At 90 ° C-96 ° C, was collected as a pale yellow oil (acrylic acid 55 / 75g ester 10-undecene) in the 0. 88mmHg. 将油醇（90. 00g，0. 34mol;阿法公司（Alfa))、二氯甲烷（300mL)和三乙胺(38. 45g，0. 38mol)的混合物在冰浴中冷却。  Oleyl alcohol (. 90. 00g, 0 34mol; Alfa Company (Alfa)), dichloromethane (300 mL) and triethylamine (. 38. 45g, 0 38mol) was cooled in an ice bath. 在2小时内逐滴添加丙烯酰氯（34. 89g， 0.38mol)。 Over 2 hours was added dropwise acryloyl chloride (34. 89g, 0.38mol). 将混合物在室温下搅拌17小时，然后过滤。 The mixture was stirred at room temperature for 17 hours and then filtered. 将溶液在真空条件下浓缩。 The solution was concentrated under vacuum. 将原油加载于硅胶柱上并用己烷洗脱。 The crude oil loaded onto a silica gel column and eluted with hexane. 将洗脱溶液在真空条件下收集并浓缩以提供无色油性液体(68. 25g的丙烯酸油酯）。 The eluted solution was collected and concentrated to afford a colorless oily liquid (68. 25g acrylic acid ester oil) under vacuum conditions. Brii02 丙燔酸醅（Brii02A)根据US2012/0154811 制备。  Brii02 propionic acid burnt grains (Brii02A) prepared according to US2012 / 0154811. 组合物通过以下方式制备：向500mL的广口瓶装填270g(90重量％ )的丙烯酸2-辛酯（20A)、30g(10重量％)的丙烯酸（AA;巴斯夫公司（BASF))、0.12g(0.04phr)的光引发剂1(2, 2-二甲氧基-2-苯基苯乙酮，Irgacure651 ;巴斯夫公司（BASF))和如表1所示phr量的单官能丙烯酸酯中的一种（得自制备例）。  The composition was prepared in the following manner: Fill 270g (90 wt%) of acrylic acid 2-octyl (20A) to a wide-mouth bottle of 500mL, 30g (10 wt%), acrylic acid (AA; BASF (BASF)) , 0.12g (0.04phr) photoinitiator 1 (2, 2-dimethoxy-2-phenylacetophenone, of Irgacure651; BASF (BASF)) and the amount as shown in table 1 phr monofunctional acrylate an ester of (from Preparative Example). 将单体混合物用氮气吹扫10分钟， 然后暴露于低强度UVA光（小于10mW/cm2,称为UVA，因为它们的输出主要在介于320nm 和390nm之间，其中峰射线在UVA光谱区域中的约350nm处），直至形成可涂覆型预聚物衆料（100-8000cP的布鲁克菲尔德粘度），之后将附加0. 48g(0. 16phr)的光引发剂1混合到组合物中。 The monomer mixture was purged with nitrogen for 10 minutes then exposed to low intensity UVA light (less than 10mW / cm2, known as UVA, because their output primarily between 320nm and 390 nm, wherein the peak UVA radiation in the spectral region at about 350nm), until a coatable prepolymer all the material (100-8000cP Brookfield viscosity), after which the additional light 0. 48g (0. 16phr) mixing an initiator into the composition. 然后，将预粘合剂（即，浆料）组合物以约5密耳（127微米）的厚度涂布在隔离衬件上，并通过进一步暴露于如表1所示的350BL灯泡（40瓦，欧司朗喜万年公司（Osram Sylvania))的UVA光持续不同时间在氮气气氛条件下固化以形成压敏粘合剂（PSA)。  Then, the pre-adhesive (i.e., a slurry) composition at a thickness of about 5 mils (127 microns) coated on a release liner, and by further exposure to 1, as shown in Table 350BL bulbs (40 watt, Osram Sylvania company (Osram Sylvania)) UVA light cured for different periods of time under a nitrogen atmosphere conditions to form a pressure sensitive adhesive (PSA). 总能量使用配备有低强度感测头的Powermap™辐射计（购自弗吉尼亚州斯特林的电子仪表与技术公司（EITInc. ,Sterling，VA))进行测量。 The total energy usage radiometer equipped with Powermap ™ (available from Sterling, VA Electronic Instrumentation & Technology Corporation (EITInc., Sterling, VA)) low intensity sensing head is measured. 然后将PSA层合至涂底漆的2密耳聚（对苯二甲酸乙二酯）背衬（商品名为Hostaphan3SABPET膜；三菱公司（Mitsubishi))以形成用于粘合剂测试的条带。 The PSA was then laminated to a 2 mil primed poly (ethylene terephthalate) backing (tradename Hostaphan3SABPET film; Mitsubishi Corporation (Mitsubishi)) to form a test strip for adhesive tape. 比较例Cl和C2如上文所述制备，不同的是在预聚合步骤之前不添加交联剂。  Comparative Examples Cl and C2 prepared as described above, except that no crosslinking agent is added before the prepolymerization step. 将1，6-己二醇二丙烯酸酯（HDDA)在涂布和固化之前混合到预粘合剂制剂中。 1,6-hexanediol diacrylate (HDDA) before coating and curing the pre-mixed into the adhesive formulation. 比较例C3和C4如Cl和C2所述制备，不同的是交联剂为2, 4,-双（三氯甲基）-6-(3, 4-二甲氧基苯基）-三嗪（Tl)。  Comparative Examples Cl and C3 and C4 as prepared C2, except that the crosslinking agent is 2, 4 - bis (trichloromethyl) -6- (3,4-dimethoxyphenyl) - triazine (Tl). 测试粘合剂在70°C下的剪切粘附性和180°剥离粘附力。  In the test pressure-sensitive adhesive of 70 ° C for 180 ° shear adhesion and peel adhesion. 结果示于表1中。 The results are shown in Table 1. 粘合剂组合物和条带如实例1-5所述制备并测试，不同的是使用270g(90重量％ ) 的丙烯酸异辛酯（IOA)替代20A，并且使用表2所示量的交联剂。  The adhesive composition and tape as described in Example 1-5 was prepared and tested, except that 270g (90% by weight) of isooctyl acrylate (IOAs) Alternatively 20A, and the amounts shown in Table 2 the cross-linking agent. 测试结果在表2中示出。 Test results are shown in Table 2. 比较例C5-C6的粘合剂条带如比较例C1-C2所述制备并测试。  Comparative Examples C5-C6 adhesive tape article as in Comparative Examples C1-C2 prepared and tested. 结果示于表2中。 The results are shown in Table 2. 比较例C7-C8的粘合剂条带如比较例C3-C4所述制备。  Comparative Examples C7-C8 adhesive tape article as in Comparative Examples C3-C4 were prepared. 结果示于表2中。 The results are shown in Table 2. 粘合剂组合物通过以下方式制备：向8盎司的广口瓶装填45g的I0A、5g的AA、 〇. 〇2g的光引发剂1和如表3所示量和类型的单官能丙烯酸酯（得自制备例）。  The adhesive composition is prepared by: I0A 45g to fill an 8 ounce wide mouth bottles, AA 5g of square 〇2g photoinitiators 1 and shown in Table 3 and the amount of monofunctional type. acrylate (obtained in preparation Example). 单体混合物用氮气吹扫5分钟，然后暴露于低强度黑灯（15瓦，365nm峰值）的UVA光，直至粘度增加和可涂覆型浆料被制备。 The monomer mixture was purged with nitrogen for 5 minutes then exposed to low intensity black light (15 W, 365nm peak) of the UVA light, until the viscosity increased and were prepared coatable syrup. 将另外的0. 08g(0. 16phr)的光引发剂1混合到浆料中。  The additional light 0. 08g (0. 16phr) mixing an initiator to the slurry. 然后将组合物以5密耳(127微米）厚度刀涂于透光隔离衬件之间，并通过暴露于如表3所示的350BL灯泡（40瓦， 欧司朗喜万年公司（OsramSylvania))的UVA光进行固化。 The composition is then applied to 5 mil (127 microns) release liner thickness of the light-transmitting member between the knife, and by exposure to 3 As shown in Table 350BL bulbs (40 watt, Osram Sylvania Company (OsramSylvania)) of UVA light curing. 总UV暴露用UVvirad™低能量UV整合福射计（弗吉尼亚州斯特林的电子仪表与技术公司（EITInc.，Sterling,VA))进行测量条带如实例1-5所述制备，并测试剪切和剥离粘附力。 Total UV exposure using a low energy UV UVvirad Four integrated radiometer ™ (Sterling, VA Electronic Instrumentation & Technology Corporation (EITInc., Sterling, VA)) measured strip prepared as described in Example 1-5, and tested for shear cut and peel adhesion. 结果示于表3中。 The results are shown in Table 3. 粘合剂和条带如实例11-27所述制备并测试，不同的是单官能丙烯酸酯交联剂未添加至浆料组合物，而是在涂布和固化之前混合。  and the adhesive tape as described in Example 11-27 were prepared and tested, except that the monofunctional acrylate crosslinker composition was not added to the slurry, but prior to the mixing and curing the coating. 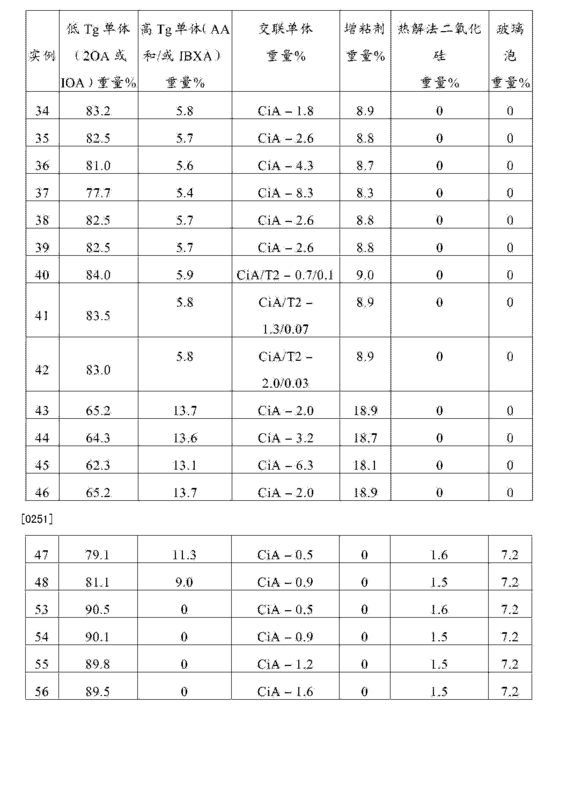 交联剂的量和测试结果示于表4中。 The amount of the crosslinking agent and the test results are shown in Table 4. 实例34-37的组合物通过如下方式制备：向500mL的广口瓶装填467. 5g(93. 5重量％)的I0A、32.5g(6.5 重量％)的AA、0.2g(0.04phr)的光引发剂2(商品名Irgacure 184 ;巴斯夫公司（BASF))，和表5所示量的CiA。  Examples 34-37 The compositions prepared in the following manner: Fill 467. 5g (93 5% wt.) To 500mL of I0A wide-mouth bottle, 32.5g (6.5 wt%) of AA, 0.2g (0.04phr ) 2 photoinitiator (trade name Irgacure 184; BASF (BASF)), and amounts shown in table 5 CiA. 单体混合物用氮气吹扫5-10分钟，然后暴露于低强度UVA辐射，直至形成可涂覆型浆料。 The monomer mixture was purged with nitrogen for 5-10 min, and then exposed to low intensity UVA radiation until a coatable syrup form. 然后，将另外的I. 75g(0. 16phr)的光引发剂2和50g(10phr)的增粘剂（商品名Foral85LB，田纳西州金斯波特的伊斯曼化学公司（EastmanChemical Co. ,Kingsport，TN))混合到每种组合物中。  Then, the light another I. 75g (0. 16phr) initiator 2 and 50g (10phr) thickener (trade name Foral85LB, Kingsport, Tennessee Eastman Chemical Company (EastmanChemical Co ., Kingsport, TN)) mixed into each composition. 然后，将组合物以4密耳（101. 6微米）的厚度涂布在隔离衬件上，并通过暴露于350BL灯泡（40瓦，欧司朗喜万年公司（Osram Sylvania))的UVA光，然后暴露于高强度UVC光（大于lOmW/cm2,称为UVC，因为灯的输出在UVC光谱区域中的介于250nm和260nm之间几乎为单色的）在氮气气氛中进行固化以形成PSA。 Then, the composition in a thickness of 4 mils (101.6 microns) coated on a release liner, and by exposure to 350BL bulbs (40 watt, Osram Sylvania Company (Osram Sylvania)) of the UVA light, and then UVC light exposure to high intensity (greater than lOmW / cm2, known as UVC, since the output of the lamp is between the UVC spectral region between 250nm and almost monochromatic 260nm) is cured in a nitrogen atmosphere to form a PSA. 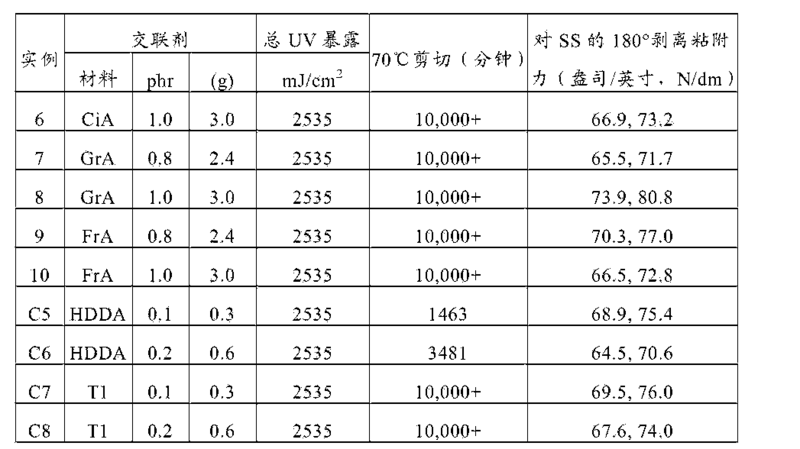 总UV暴露如实例1-5所述进行测量，并示于表5中。 Total UV exposure was measured as described in Example 1-5, and are shown in Table 5 below. 条带如实例1-5进行制备以用于粘合剂测试。 Example 1-5 The strips were prepared for adhesive testing. 实例38的组合物和条带以与实例35相同的方式制备并测试，不同的是使用20A 替代I0A。  Examples of compositions and strip 38 and test strip was prepared in the same manner as in Example 35, except that alternate 20A I0A. 所有条带的测试结果示于表5中。 Results All the test strip shown in Table 5. 组合物通过如下方式制备：向500mL的广口瓶装填420. 8g(93. 5重量％)的IOA、 29.38(6.5重量％)的厶厶、0.188(0.04?1^)的光引发剂2(商品名1找&(311代184)，和表6 所示量的CiA。单体混合物用氮气吹扫5-10分钟，然后暴露于低强度紫外线辐射直至可涂覆型浆料被制备。  The composition is prepared by: filling 420. 8g (. 93 5 wt%) of the IOA 500mL wide-mouth bottle, 29.38 (6.5 wt%) of Si Si, 0.188 light (? 1 ^ 0.04) initiator 2 agent (trade name & find 1 (311 184 generations), and the amounts shown in table 6 CiA the monomer mixture was purged with nitrogen for 5-10 min, and then exposed to low intensity ultraviolet radiation until a coatable syrup is preparation. 将另外的1.58g(0. 16phr)的光引发剂2、45g(10phr)的增粘剂（商品名Foral 85LB)和表6所示量的三嗪T2 (2, 4，-双（三氯甲基）-6-(4-甲氧基）苯基）-三嗪）混合到入组合物中。  A further light 1.58g (. 0 16phr) initiator 2,45g (10phr) tackifier (trade name Foral 85LB) and the amounts shown in Table 6 triazine T2 (2, 4, - bis (trichloromethyl) -6- (4-methoxyphenyl) phenyl) - triazine) mixed into the composition. 然后，将预粘合剂（浆料）组合物以4密耳（101. 6微米）的厚度涂布在隔离衬件上，并通过暴露于883mJ/cm2的350BL灯泡（40瓦，欧司朗喜万年公司（OsramSylvania)) 的UVA光在氮气气氛下固化。 Then, the pre-adhesive (paste) composition at a thickness of 4 mils (101.6 microns) coated on a release liner, and by exposure to 883mJ / cm2 in 350BL bulbs (40 watt, Osram hi Wan the company (OsramSylvania)) UVA light curing under nitrogen atmosphere. 总UV暴露如实例1-5所述进行测量。 Total UV exposure was measured as described in Example 1-5. 然后将PSA层合至涂底漆聚（对苯二甲酸乙二酯）（PET，三菱膜（MitsubishiFilms))背衬以用于粘合剂测试。 The PSA was then laminated to the primed poly (ethylene terephthalate) (PET, Mitsubishi film (MitsubishiFilms)) backing for adhesive testing. 实例43-45的组合物通过如下方式制备：向500mL的广口瓶装填346.9g(82. 6重量％ )的I0A、3.2g(0. 1重量％ )的AA、0. 14g(0.04phr)的光引发剂1，和表7所示量的CiA。  Examples 43-45 Compositions prepared by the following manner: Fill 346.9g (82 6% wt.) Of I0A, 3.2g (0 1% wt.) Of the AA to the wide-mouth bottle of 500mL, 0 14g (. 0.04 phr) of a photoinitiator, and amounts shown in table 7 CiA agent. 单体混合物用氮气吹扫5-10分钟，然后暴露于低强度紫外线辐射以形成可涂覆型浆料。 The monomer mixture was purged with nitrogen for 5-10 min, and then exposed to low intensity ultraviolet radiation to form a coatable syrup. 添加另外的0•84g(0. 16phr)的光引发剂1、0.26g的抗氧化剂（Irganox1076)、 70g(17重量％ )的丙烯酸异冰片酯（IBXA)，和100. 8g(24phr)的增粘剂（商品名Regalrez 6108)。  Add additional 0 • 84g (0. 16phr) photoinitiator of an antioxidant agent 1,0.26g (Irganox1076), 70g (17 wt%) of isobornyl acrylate (IBXA), and 100. 8g (24phr ) thickener (trade name Regalrez 6108). 组合物通过滚动过夜充分地混合，并以5密耳（127微米）的厚度涂布在于隔离衬件上，并通过暴露于827mJ/cm2的UVA光然后暴露于236mJ/cm2的UVC光在氮气气氛下固化以形成PSA，如实例34-39所述。 The composition is sufficiently mixed by rolling overnight, and a thickness of 5 mils (127 microns) coated on a release liner that member, and the light is then exposed to UVC 236mJ / cm2 by exposure to 827mJ / cm2 of UVA light in a nitrogen atmosphere cured to form a PSA, as described in example 34-39. 总UV暴露如实例1-5所述进行测量。 Total UV exposure was measured as described in Example 1-5. 然后将PSA层合至涂底漆聚（对苯二甲酸乙二酯）（PET，三菱膜（MitsubishiFilms))背衬以用于粘合剂测试。 The PSA was then laminated to the primed poly (ethylene terephthalate) (PET, Mitsubishi film (MitsubishiFilms)) backing for adhesive testing. 结果示于表7中。 The results are shown in Table 7. 实例46的组合物和条带使用20A而非IOA制备。  Example 46 was prepared with the composition and article 20A IOA used instead. 实例47通过如下方式制备：向500mL的广口瓶装填306. 3g(87. 5重量％)的10八、 43. 8g(12. 5 重量％ )的AA、0. 14g(0, 04phr)的光引发剂1，和2.lg(0. 6phr)的CiA。  Example 47 was prepared by the following manner: Fill 306. 3g (87 5% wt.) To 500mL of 10 eight wide-mouth bottle, 43. 8g (12 5% wt.) Of AA, 0 14g (0,. 04phr) a photoinitiator, and 2.lg (0. 6phr) of CiA. 将单体混合物用氮气吹扫10分钟，然后暴露于低强度UVA辐射，直至形成可涂覆型浆料，此后再添加0.67g(0. 16phr)的光引发剂1。 The monomer mixture was purged with nitrogen for 10 minutes then exposed to low intensity UVA radiation until a coatable syrup, after which the light is added 0.67g (0. 16phr) an initiator. 接下来，添加6.0g(1.7phr)的商品名HDKH15热解法二氧化娃（威凯硅氧烷（WackerSilicones))，然后将衆料用商品名Netzsch50型分散器进行混合。 Next, add 6.0g (1.7phr) trade name HDKH15 baby fumed silica (Wacker silicone (WackerSilicones)), and then all the materials were mixed with a trade name Netzsch50 type disperser. 当热解法二氧化硅完全分散时，添加28g(Sphr)的玻璃泡（K15,明尼苏达州圣保罗的3M公司（3MCompany,St.PaulMN))，并且组合物通过滚动过夜充分混合。 When complete dispersion of fumed silica was added 28g (Sphr) glass bubbles (K15, St. Paul, Minnesota 3M Company (3MCompany, St.PaulMN)), and the composition is thoroughly mixed by rolling overnight. 然后，将组合物以38密耳（965. 2微米）的厚度涂布于隔离衬件之间，并通过741mJ/cm2的350BL灯泡（40瓦，欧司朗喜万年公司（OsramSylvania))的UVA光进行固化以形成PSA。  Then, the composition in a thickness of 38 mils (965.2 microns) is applied between release liner member, and through 350BL lamp 741mJ / cm2 (40 watt, Osram Sylvania Company (OsramSylvania)) UVA light cured to form a PSA. 总UV暴露如实例1-5所述进行测量。 Total UV exposure was measured as described in Example 1-5. 实例C9的组合物和条带如实例47制备，不同的是未将CiA添加至浆料组合物，并且在涂布之间将0. 19g(0. 055phr)HDDA添加至浆料。  Examples of compositions and C9 strips prepared as in Example 47, except that CiA not added to the slurry composition, and (. 055phr 0) HDDA is added to the slurry between 0. 19g is applied. 实例48的组合物和条带如实例47制备，不同的是浆料的组合物为315g(90重量％)的20A、35g(10 重量％)的AA、0. 14g(0.04phr)的光引发剂1，和3.5g(lphr)的CiA。  Example 48 Compositions and strips prepared as Example 47, except that the slurry composition is 315g (90 wt%) of 20A, 35g (10 wt%) of AA, 0. 14g (0.04phr) 1 photoinitiator, and 3.5g (lphr) of CiA agent. 实例ClO的组合物和条带如实例C9制备，不同的是使用实例48的组合物。  Examples of compositions and ClO strips prepared as Example C9, except that the composition of Example 48. 制备实例47-48和C9-10用于粘合剂测试，并且如测试方法3和4所列进行测试。  Preparation of Examples 47-48 and C9-10 for adhesive testing, and as set forth in Test Method 3 and 4 were tested. 测量实例3、35-38、40_42和45和C3的粘合剂样品的黄变，如上所述。  Examples 3,35-38,40_42 measurement sample 45 and adhesive yellowing and C3, as described above. 结果示于表9中。 The results are shown in Table 9. 粘合剂组合物和条带49通过以下方式制得：向玻璃瓶装填54g(90重量％ ) 的20A、6g(10 重量％)的AA、0.6g(lphr)的CiA、0.06g(0.1phr)的Vazo52(杜邦公司(Dupont))和140g的乙酸乙酯。  The adhesive composition and the tape 49 was prepared in the following manner: 20A, 6g (10 wt%) of a glass bottle filled AA 54g (90 wt%), 0.6g (lphr) of CiA, 0.06g (0.1phr) of Vazo52 (DuPont (Dupont)) and 140g of ethyl acetate. 该混合物用氮气吹扫20分钟，并将瓶密封并置于52°C水浴中摇动20小时。 The mixture was purged with nitrogen for 20 minutes, and the bottle was sealed and placed in a 52 ° C water bath and shaken for 20 hours. 然后将瓶移除，并用空气曝气1分钟。 The vial was then removed, and aerated with air for 1 minute. 将30g的最终聚合物溶液在广口瓶中与0. 17g(2phr)的光引发剂1合并并滚动以确保充分混合。 The final polymer solution of 30g of the light in the jar 0. 17g (2phr) an initiator were combined and rolling to ensure adequate mixing. 然后，将组合物以5密耳(127微米）的厚度涂布在2密耳厚的三菱公司（Mitsubishi)Hostaphan3SABPET上，并在70°C下的烘箱中干燥30分钟。 Then, the composition was 2 mil Mitsubishi Corporation (Mitsubishi) Hostaphan3SABPET, and dried to a thickness of 5 mils (127 microns) is applied in an oven at 70 ° C for 30 minutes. 干燥粘合剂用隔离衬件覆盖并暴露于982mJ/cm2的UVA 光10分钟以上。 Drying the adhesive member is covered with a release liner and exposed to 982mJ / cm2 UVA light for more than 10 minutes. 然后，根据测试方法1和2进行粘合剂测试，不同的是剪切强度测试在室温而非70 °C下进行。 Then, the adhesive tested according to Test Methods 1 and 2, except that the shear strength tests conducted at room temperature instead of 70 ° C. 结果示于表10中。 The results are shown in Table 10. 粘合剂组合物和条带50以与实例46相同的方式制备并测试，不同的是组合物为90g(90 重量％)的20A、10g(10 重量％)的AA、2g(2phr)的CiA、0.04g(0.04phr)的硫基乙醇酸异辛酯、〇•Ig(〇•Iphr)的Vazo67 (杜邦公司（Dupont))和233. 3g的乙酸乙酯，并且以762mJ/cm2的UVA光进行固化10分钟以上。  The adhesive composition and the strip 50 prepared in the same manner as in Example 46 and tested composition except that 90g (90 wt%) of 20A, 10g (10 wt%) of AA, 2g (2phr ) is CiA, 0.04g (0.04phr) of isooctyl thioglycolate, square • Ig (square • Iphr) of Vazo 67 (DuPont (Dupont)) 233. 3g and ethyl acetate, and at 762mJ / cm2 UVA light for 10 minutes or cured. 粘合剂组合物51以与组合物49完全相同的方式制备并测试，不同的是未添加光引发剂。  51 adhesive compositions were prepared and tested in the composition 49 in exactly the same manner, except that no added photoinitiator. 粘合剂组合物52以与组合物50完全相同的方式制备，不同的是未添加光引发剂。 The adhesive composition 52 in the composition 50 was prepared in exactly the same manner, except that no added photoinitiator. 粘合剂组合物和条带Cll以与实例49相同的方式制备并测试，不同的是组合物不含CiA，并且以2011mJ/cm2的UVA光进行固化10分钟以上。  The adhesive composition and tape Cll to Example 49 was prepared and tested in the same manner, except that the composition does not contain the CiA, and to UVA 2011mJ / cm2 or more light-cured for 10 minutes. 实例53和54通过如下方式制备：向500mL的广口瓶装填350g(100重量％ )的20A、0g(0重量％ )的AA、0. 14g(0, 04phr)的光引发剂1，和根据表11的量的CiA。  Examples 53 and 54 was prepared in the following manner by: filling 350g to 500mL wide-mouth bottle (100 wt%) of 20A, 0g (0 wt%) of AA, 0 14g (0, 04phr) photoinitiator 1 , and CiA table 11 according to the amount. 将单体混合物用氮气吹扫10分钟，然后暴露于低强度UVA辐射，直至形成可涂覆型浆料，此后再添加0.67g(0.16phr)的光引发剂1。 The monomer mixture was purged with nitrogen for 10 minutes then exposed to low intensity UVA radiation until a coatable syrup form, this light then added 0.67g (0.16phr) an initiator. 接下来，添加6.0g(1.7phr)的HDKH15热解法二氧化娃（威凯硅氧烷（WackerSilicones))，将衆料用Netzsch50型分散器进行混合。 Next, add 6.0g (1.7phr) of baby HDKH15 fumed silica (Wacker silicone (WackerSilicones)), all the materials were mixed with a disperser Netzsch50 type. 当热解法二氧化硅完全分散时，添加28g(8phr)的玻璃泡（K15,明尼苏达州圣保罗的3M公司（3M Company,St.PaulMN))，并且组合物通过滚动过夜充分混合。 When complete dispersion of fumed silica was added 28g (8phr) glass bubbles (K15, St. Paul, Minnesota 3M Company (3M Company, St.PaulMN)), and the composition is thoroughly mixed by rolling overnight. 然后，将组合物以25密耳(635微米）的厚度涂布于隔离衬件和涂底漆2密耳聚对苯二甲酸乙二酯（PET)之间，并通过特定剂量的350BL灯泡（40瓦，欧司朗喜万年公司(OsramSylvania))的UVA光（表11所示）进行固化以形成PSA。  Then, the composition in a thickness of 25 mils (635 microns) is applied to a release liner member and primed between 2 mil polyethylene terephthalate (PET), and by the specific dose 350BL bulbs (40 watt, Osram Sylvania company (OsramSylvania)) UVA light (table 11) and cured to form a PSA. 总UV暴露如实例1-5 所述进行测量。 Total UV exposure was measured as described in Example 1-5. 粘合剂性质根据测试方法6和7进行测试，并示出于表11中。 Adhesive properties were tested according to Test Method 6 and 7, and shown in Table 11. 实例55和56如上所述制备，不同在于下述内容：1)初始组合物包含300g(100重量％ )的20A、0g(0重量％ )的AA、0. 12g(0.04phr)的光引发剂1，和根据表11量的CiA， 2)在制备预聚物浆料之后，添加0• 57g(0. 16phr)的光引发剂1、5.lg(l. 7phr)的HDKH15热解法二氧化硅，和24g(8phr)的玻璃泡。 Preparation of  Examples 55 and 56 described above, except that the following: 1) the initial composition comprising 300g (100 wt%) of 20A, 0g (0 wt%) of AA, 0 12g (0.04phr) of a photoinitiator, and an amount according to table 11 CiA, 2) after preparation of the prepolymer slurry, add 0 • light 57g (0. 16phr) initiator 1,5.lg (l. 7phr) of heat HDKH15 fumed silica, and 24g (8phr) glass bubbles. 对于流变学测量，可涂覆型组合物以相同方式以25 密耳的厚度涂布并固化。 For rheological measurements, coatable compositions in the same manner as applied to a thickness of 25 mil and cured. 粘合剂组合物和条带57-60以与实例11-25完全相同的方式制备并测试。  The adhesive composition and article with 11-25 prepared in exactly the same manner as in Example 57-60 and tested. 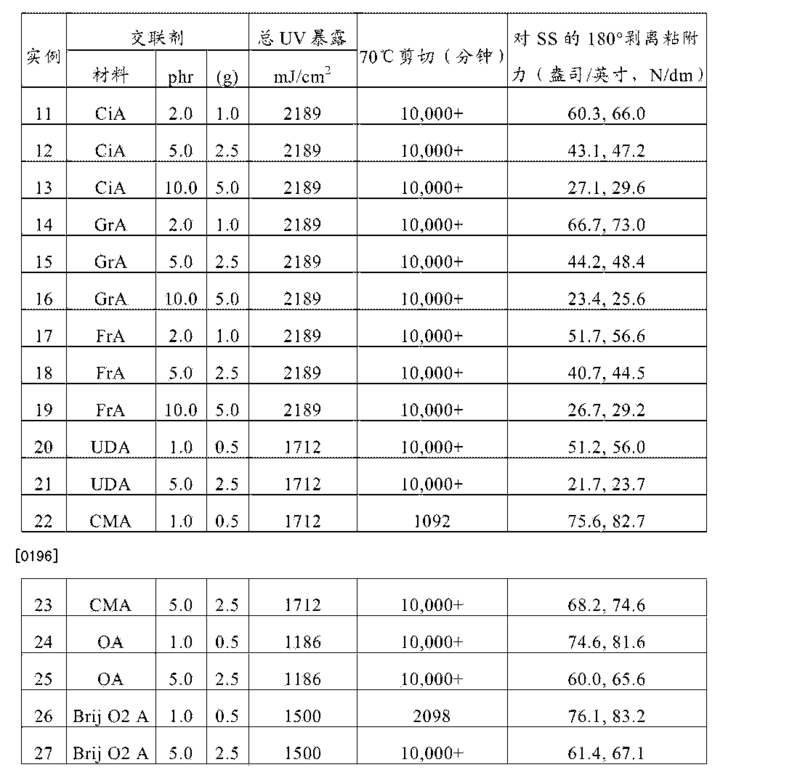 所采用的交联剂和粘合剂性质示于表12中。 Adhesive properties and crosslinking agents used are shown in Table 12. 丙烯酸二环戊二烯（DPA)可购自美国新罕布什尔州温德姆的单体_ 聚合物实验室公司（Monomer-PolymerLaboratories(Windham,NH,USA)) 〇乙二醇二环戊二烯基醚丙烯酸酯（EGDA)可购自奥德里奇公司（Aldrich)。 Acrylate, dicyclopentadiene (DPA) commercially available from Windham, NH _ Polymer Laboratories monomers (Monomer-PolymerLaboratories (Windham, NH, USA)) square dicyclopentadiene glycol ether acrylate (EGDA) commercially available from Aldrich (Aldrich). 1. 一种压敏粘合剂组合物，包含： 至少50重量％的聚合单元，所述聚合单元衍生自（甲基）丙烯酸烷基酯单体；和0. 2重量％至15重量％的至少一种交联单体，所述至少一种交联单体包含（甲基）丙烯酸酯基团和C6-C2。 A pressure-sensitive adhesive composition, comprising: at least 50 wt% polymerized units, units derived from (meth) acrylic acid alkyl ester monomer The polymerization; and 0.2 wt% to 15 wt% of at least one crosslinking monomer, said crosslinking monomer comprising at least one (meth) acrylate group and a C6-C2. 烯烃基团，所述烯烃基团为直链或支链的，并任选地被取代。 Olefinic groups, said olefinic group is a straight-chain or branched, and optionally substituted. 2. 根据权利要求1所述的压敏粘合剂组合物，其中所述压敏粘合剂包含至少55重量％、60重量％、65重量％、或70重量％的聚合单元，所述聚合单元衍生自一种或多种（甲基）丙稀酸烷基酯单体。 The polymerized units of pressure sensitive adhesive composition according to claim 1, wherein the pressure-sensitive adhesive comprises at least 55 wt%, 60 wt%, 65 wt%, or 70% by weight of the polymeric units derived from one or more (meth) acrylic acid alkyl ester monomer. R1 为H或CH3， L为任选的连接基团；并且R2为任选地取代的C6-C2。 R1 is H or CH3, L is an optional linking group; and R2 is optionally substituted C6-C2. 烯烃基团。 Olefinic groups. 4. 根据权利要求3所述的压敏粘合剂组合物，其中L包含一个或多个烯化氧基团。 4. The pressure sensitive adhesive composition according to claim 3, wherein L comprises one or more alkylene oxide groups. 5. 根据权利要求3或4所述的压敏粘合剂组合物，其中所述交联单体选自香茅（甲基） 丙烯酸酯、（甲基）丙烯酸香叶酯、（甲基）丙烯酸金合欢酯、（甲基）丙烯酸十一碳烯酯、 和（甲基）丙烯酸油酯。 The pressure sensitive adhesive composition according to claim 3 or claim 4, wherein the crosslinking monomer is selected from citronella (meth) acrylate, (meth) acrylic acid, geranyl acetate, (meth) acacia acrylate ester, (meth) acrylate, undecenyl acrylate, and (meth) acrylic acid ester oil. 6. 根据权利要求1至5所述的压敏粘合剂组合物，其中所述压敏粘合剂组合物包含至少50重量％、55重量％、60重量％、65重量％、或70重量％的（甲基）丙烯酸烷基酯的聚合单元，所述（甲基）丙烯酸烷基酯包含6至20个碳原子。 The pressure sensitive adhesive composition of claim 1 to 5, wherein the pressure-sensitive adhesive composition comprises at least 50 wt%, 55 wt%, 60 wt%, 65 wt%, or 70 wt. % of polymerized units of (meth) acrylic acid alkyl ester, the (meth) acrylic acid alkyl ester containing 6 to 20 carbon atoms. 7. 根据权利要求1至6所述的压敏粘合剂组合物，其中所述压敏粘合剂包含总碳含量的至少25重量％的生物基含量。 7. The pressure sensitive adhesive composition according to claim 16, wherein the pressure-sensitive adhesive comprises at least 25 wt of the total carbon content of biobased content%. 8. 根据权利要求1至7所述的压敏粘合剂组合物，其中所述压敏粘合剂包含衍生自(甲基）丙烯酸2-辛酯的聚合单元。 8. The pressure sensitive adhesive composition according to claim 71, wherein said pressure sensitive adhesive comprises units derived from (meth) acrylate, 2-octyl ester of polymerized units. 9. 根据权利要求1至8所述的压敏粘合剂组合物，其中所述压敏粘合剂还包含填料。 9. The pressure sensitive adhesive composition according to claim 18, wherein the pressure sensitive adhesive further contains a filler. 10. 根据权利要求9所述的压敏粘合剂组合物，其中所述填料包括热解法二氧化硅、玻璃泡、或它们的组合。 10. The pressure sensitive adhesive composition according to claim 9, wherein said filler comprises fumed silica, glass bubbles, or a combination thereof. 11. 根据权利要求1至10所述的压敏粘合剂组合物，其中所述压敏粘合剂组合物还包含增粘剂。 11. The pressure sensitive adhesive composition according to claim 110, wherein the pressure-sensitive adhesive composition further comprises a tackifier. 12. 根据权利要求1至11所述的压敏粘合剂组合物，其中所述压敏粘合剂组合物还包含聚合单元，所述聚合单元衍生自至少一种单体，所述至少一种单体选自酸官能单体、非酸官能极性单体、乙烯基单体、以及它们的组合。 12. The pressure sensitive adhesive composition according to claim 1 to 11 claim, wherein the pressure-sensitive adhesive composition further comprises polymerized units, units derived from the polymerization of at least one monomer, the at least one monomers selected from acid functional monomers, non-acid functional polar monomers, vinyl monomers, and combinations thereof. 13. 根据权利要求1至12所述的压敏粘合剂组合物，其中所述压敏粘合剂还包含多官能（甲基）丙烯酸酯交联剂、三嗪交联剂、或它们的组合。 13. The pressure sensitive adhesive composition according to claim 1 to 12 claim, wherein the pressure sensitive adhesive further comprises a polyfunctional (meth) acrylate crosslinking agents, triazine crosslinking agents, or their combination. 14. 根据权利要求1至13所述的压敏粘合剂组合物，其中所述压敏粘合剂在固化之后表现出至少15N/dm的对不锈钢的180°度的剥离粘附力。 14. A pressure sensitive adhesive composition according to claim 113, wherein the pressure-sensitive adhesive exhibits at least 15N / dm peel adhesion to stainless steel of 180 ° after curing. 15. 根据权利要求1至14所述的压敏粘合剂组合物，其中所述压敏粘合剂组合物包含0重量％至1. 0重量％的衍生自酸官能单体的聚合单元。 15. A pressure sensitive adhesive composition according to claim 114, wherein the pressure-sensitive adhesive composition comprises 0 wt% to 1.0 wt% of units derived from acid functional monomers polymerized units. 16. 根据权利要求1至15所述的压敏粘合剂组合物，其中所述压敏粘合剂组合物包含0重量％至10重量％的衍生自高Tg单体的聚合单元。 16. A pressure sensitive adhesive composition according to claim 115, wherein the pressure-sensitive adhesive composition comprises polymerized units of 10% by weight to 0% by weight of units derived from high Tg monomers. 17. 根据权利要求1至16所述的压敏粘合剂组合物，其中所述压敏粘合剂组合物能够从纸材干净地移除或能够重复使用，或具有至少500分钟的对橘皮干燥壁250g重量的剪切力，或它们的组合。 17. A pressure sensitive adhesive composition according to claim 116, wherein the pressure-sensitive adhesive composition can be cleanly removed from the paper or reusable, or at least 500 minutes for Tangerine skin dryness wall shear forces 250g weight, or a combination thereof. 18. -种压敏粘合剂制品，所述压敏粘合剂制品包含设置在隔离衬件上的根据权利要求1至17所述的压敏粘合剂组合物。 18. - pressure sensitive adhesive article comprising the pressure-sensitive adhesive article according to claim disposed on a release liner of the pressure sensitive adhesive composition according to claim 1 to 17. 19. 一种压敏粘合剂制品，所述压敏粘合剂制品包含位于背衬上的根据权利要求1至16所述的压敏粘合剂组合物。 19. A pressure sensitive adhesive article, the article comprising a pressure sensitive adhesive located on a backing pressure sensitive adhesive composition of claim 1 to claim 16. 20. -种粘合剂组合物，所述粘合剂组合物包含浆料，所述浆料包含i) 自由基聚合型溶剂单体；和ii) 溶质（甲基）丙烯酸类聚合物，所述溶质（甲基）丙稀酸类聚合物包含聚合单元， 所述聚合单元衍生自一种或多种（甲基）丙烯酸烷基酯单体， 其中所述浆料包含至少一种交联单体，或所述（甲基）丙稀酸类溶质聚合物包含聚合单元，所述聚合单元衍生自至少一个种交联单体，所述交联单体包含（甲基）丙烯酸酯基团和C6-C2。 20. - kind of pressure-sensitive adhesive composition, the adhesive composition comprises a slurry, the slurry comprises i) free-radically polymerizable solvent monomer; and ii) a solute (meth) acrylic polymer, the said solute (meth) acrylic acid-based polymer comprising polymerized units, at least one of said polymerizable crosslinking monomer units derived from one or more (meth) acrylate monomer, wherein said slurry comprises thereof, or the (meth) acrylic acid-based polymer comprises polymerized units of a solute, the polymerized units derived from at least one kind of crosslinking monomer, the crosslinking monomer comprises (meth) acrylate group, and C6-C2. 烯烃基团，所述烯烃基团为直链的、支链的、或环状的，并任选地被取代。 Olefinic groups, said olefinic group is linear, branched, or cyclic, and is optionally substituted. 21. 根据权利要求20所述的粘合剂组合物，其中所述粘合剂为根据权利要求1至17的组合中任一项所述的压敏粘合剂。 21. The adhesive composition according to claim 20, wherein the adhesive is a pressure sensitive adhesive composition 1 to 17 in any one of claims. 22. 根据权利要求20所述的粘合剂组合物，其中所述粘合剂不是压敏粘合剂。 22. The adhesive composition according to claim 20, wherein the adhesive is not a pressure sensitive adhesive. 23. 根据权利要求20至22所述的粘合剂组合物，其中所述浆料不含非聚合型溶剂。 23. The adhesive composition of claim 20 to claim 22, wherein the slurry is free of non-polymerizable solvent. 24. -种交联粘合剂组合物，所述交联粘合剂组合物包含根据权利要求20至23所述的粘合剂的固化反应产物。 24. - Species crosslinkable binder composition, a crosslinkable binder composition comprises from 20 to cure the adhesive according to claim 23 reaction product. 25. -种制备粘合剂组合物的方法，所述方法包括： a) 提供根据权利要求20至23所述的浆料；以及b) 向基材施加所述衆料；以及c) 照射所施加的浆料，从而使所述粘合剂组合物交联。 25. - The method of preparing an adhesive composition of the kinds, the method comprising: a) providing a slurry according to claim 20 to 23; and b) applying to said public base material; and c) irradiation the slurry is applied so that the adhesive composition is crosslinked. 26. 根据权利要求25所述的方法，其中所述粘合剂为根据权利要求1至17的组合中任一项所述的压敏粘合剂。 26. A method according to claim 25, wherein the adhesive is a pressure sensitive adhesive composition 1 to 17 in any one of claims. 27. -种制备粘合剂组合物的方法，所述方法包括： a) 在有机溶剂中聚合i) 一种或多种（甲基）丙烯酸烷基酯单体，和ii) 交联单体，所述交联单体包含（甲基）丙烯酸酯基团和(：6-(：2。烯烃基团，所述烯烃基团任选地被取代；以及b) 向基材施加聚合单体的溶液；以及c) 固化所述溶液，从而使所述粘合剂组合物交联。 27. - The method of preparing an adhesive composition of the kinds, the method comprising: a) polymerization in an organic solvent i) one or more (meth) acrylate monomer, and ii) a crosslinking monomer , the crosslinking monomer comprises (meth) acrylate group, and (: 6 - (: 2 olefinic groups, said olefinic group optionally substituted; and b) applying to a substrate a polymerizable monomer solution; and c) curing said solution so that the adhesive composition is crosslinked. 28. 根据权利要求27所述的方法，其中所述固化包括辐射固化。 28. The method according to claim 27, wherein said curing comprises radiation curing. 29. 根据权利要求27所述的方法，其中所述固化包括热固化。 29. The method of claim 27, wherein the curing comprises thermal curing. 30. 根据权利要求27至29所述的方法，其中所述有机溶剂不是聚合型溶剂。 30. The method of claim 27 to claim 29, wherein said solvent is not an organic polymer solvent. 31.根据权利要求27至30所述的方法，其中所述粘合剂为根据权利要求1至17的组合中任一项所述的压敏粘合剂。 27 to 31. The method according to claim 30, wherein the adhesive is a pressure sensitive adhesive composition 1 to 17 in any one of claims.